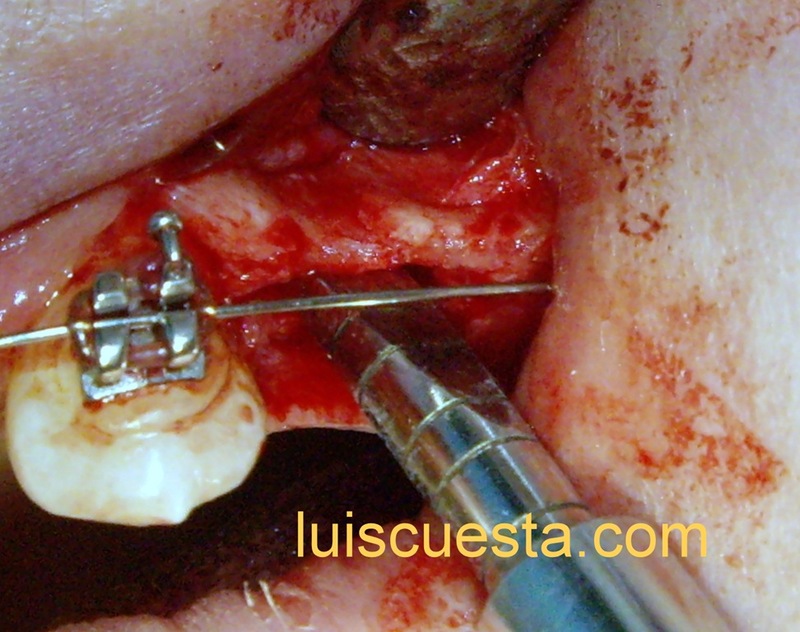 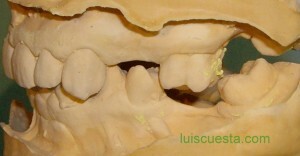 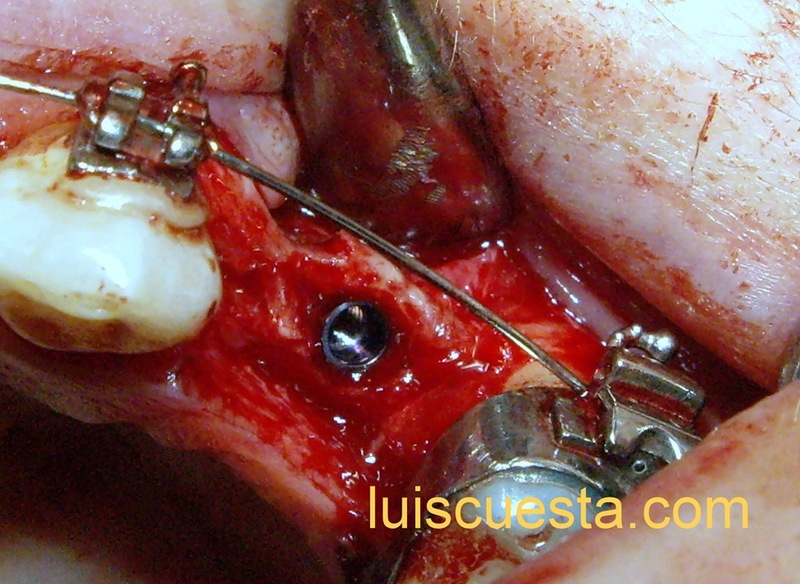 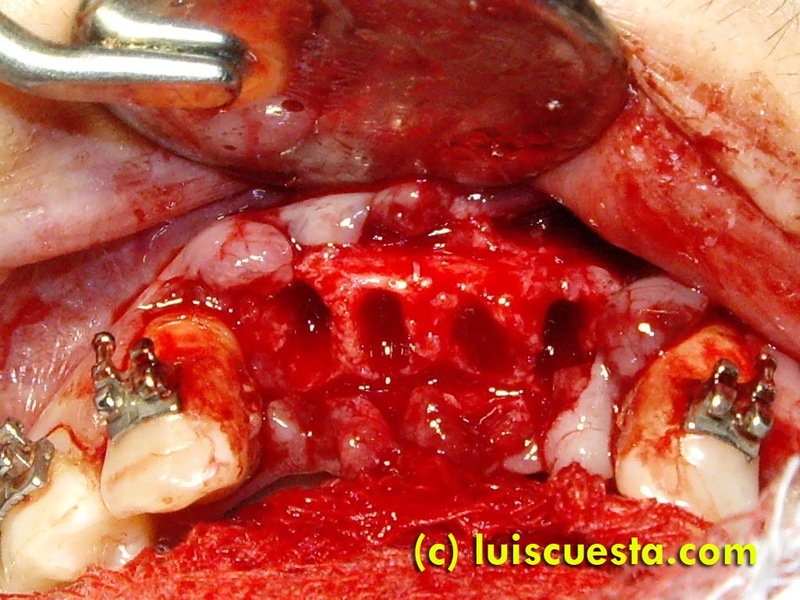 Bone splitting and widening of a narrow jaw ridge in the edentulous maxilla. 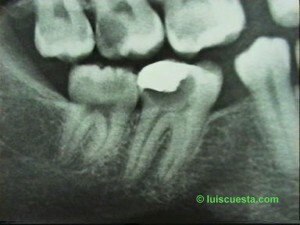 Single tooth. 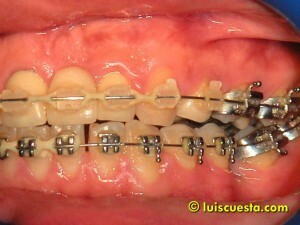 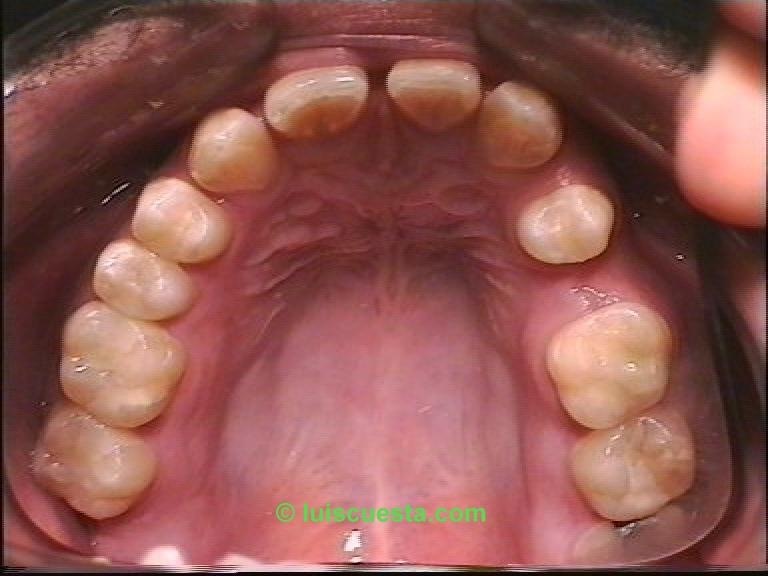 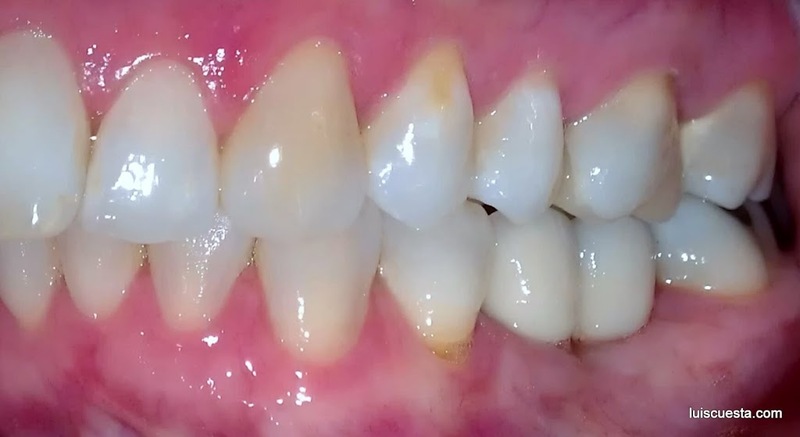 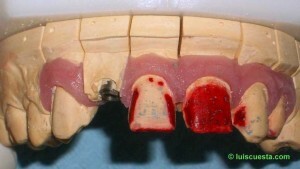 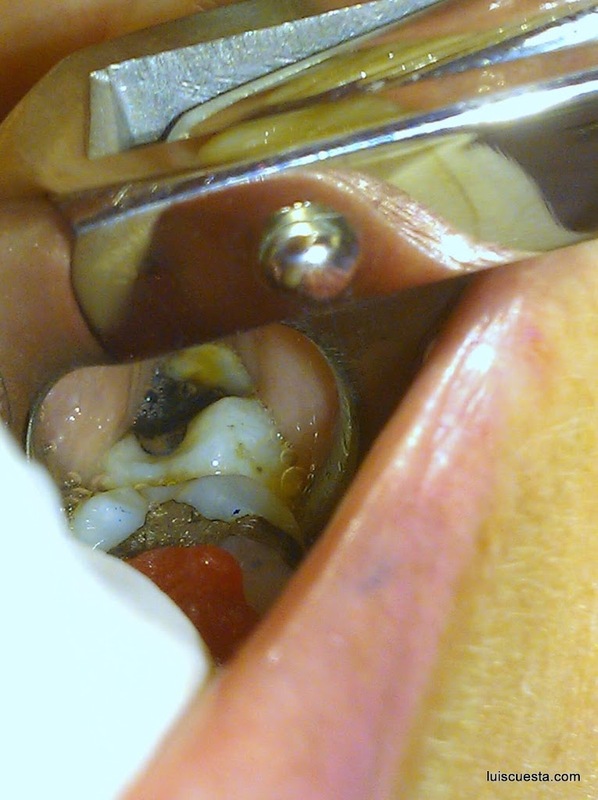 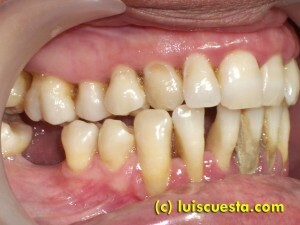 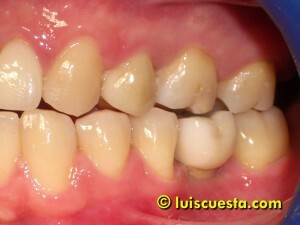 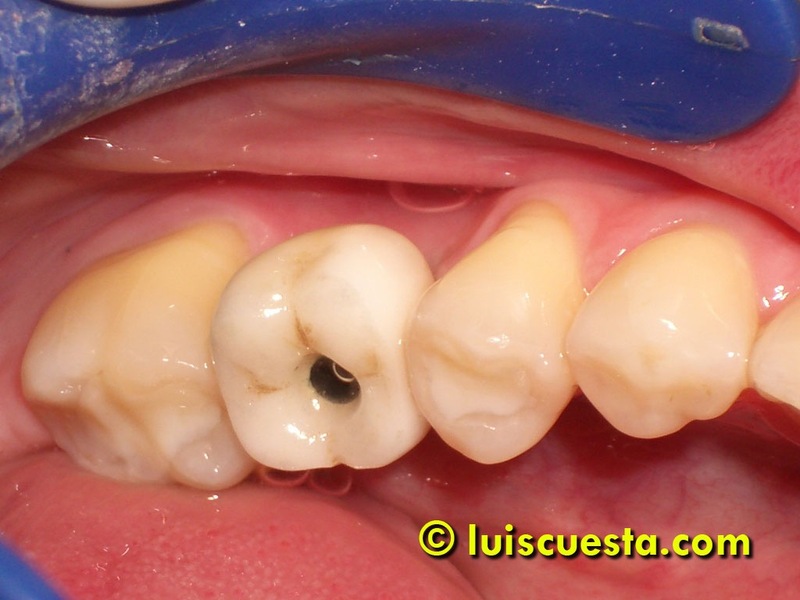 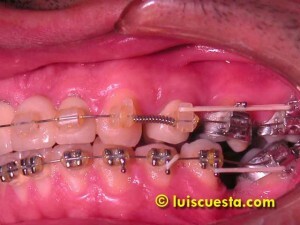 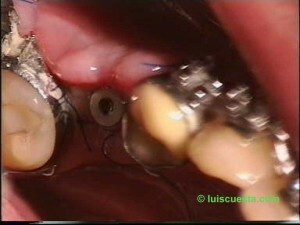 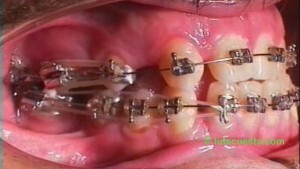 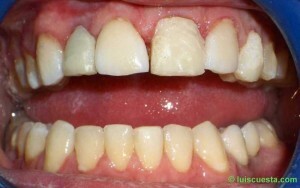 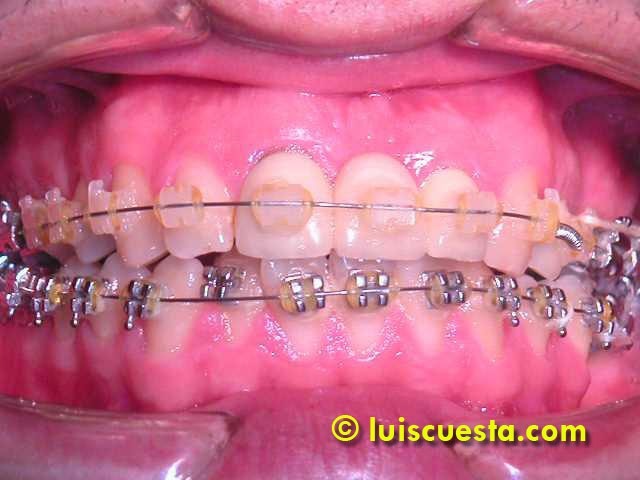 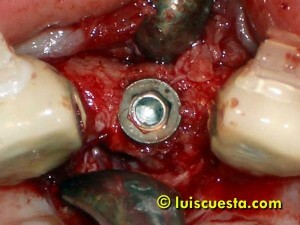 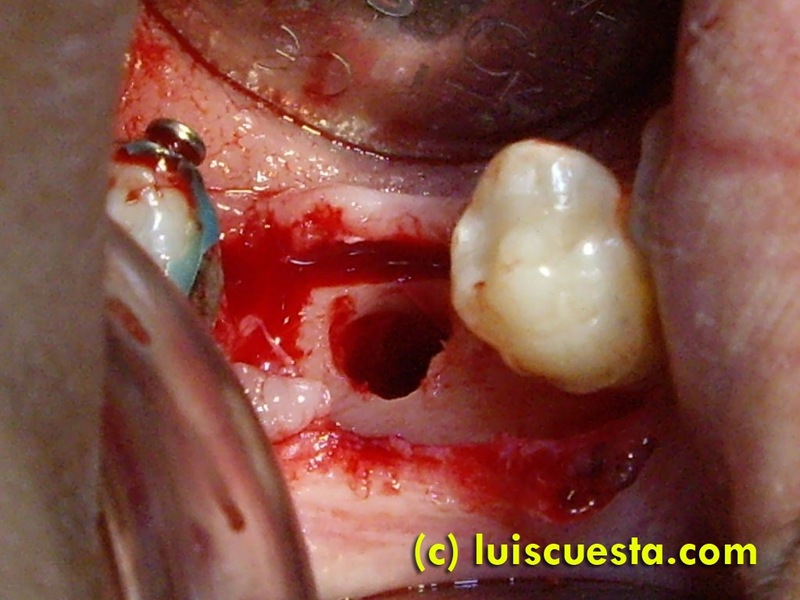 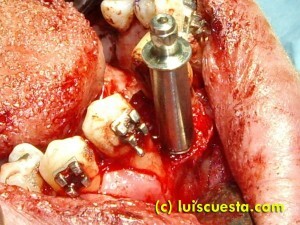 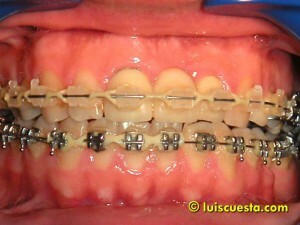 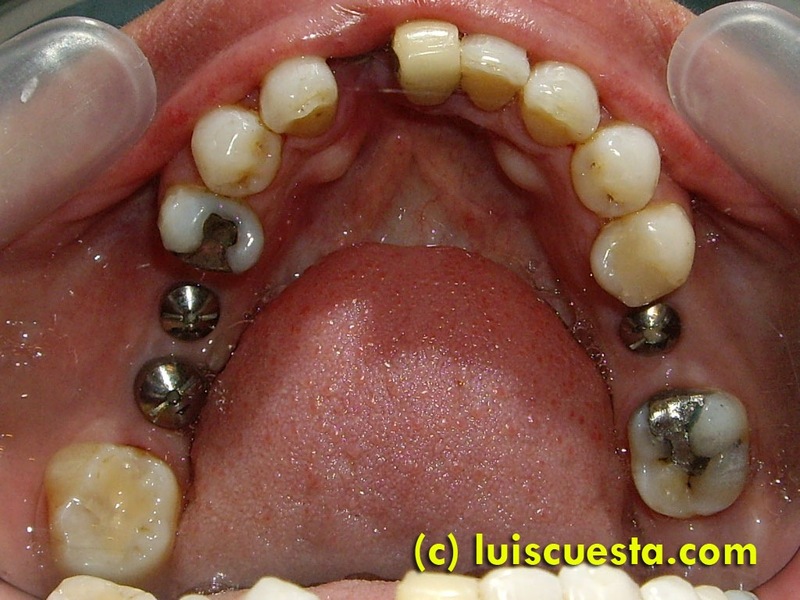 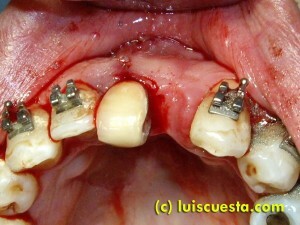 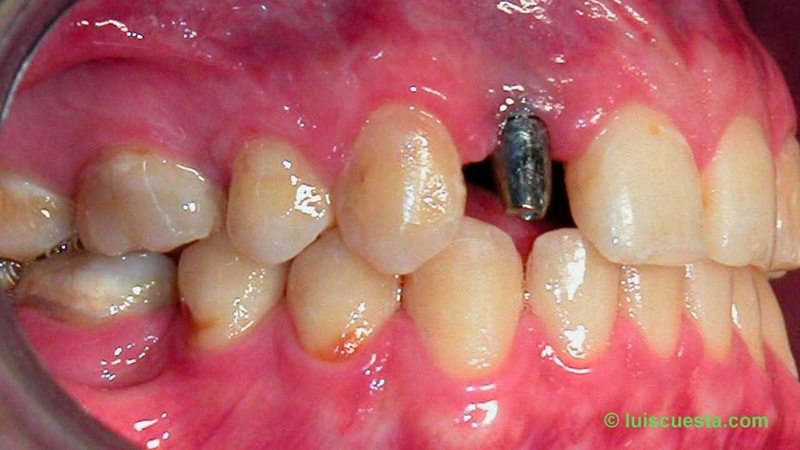 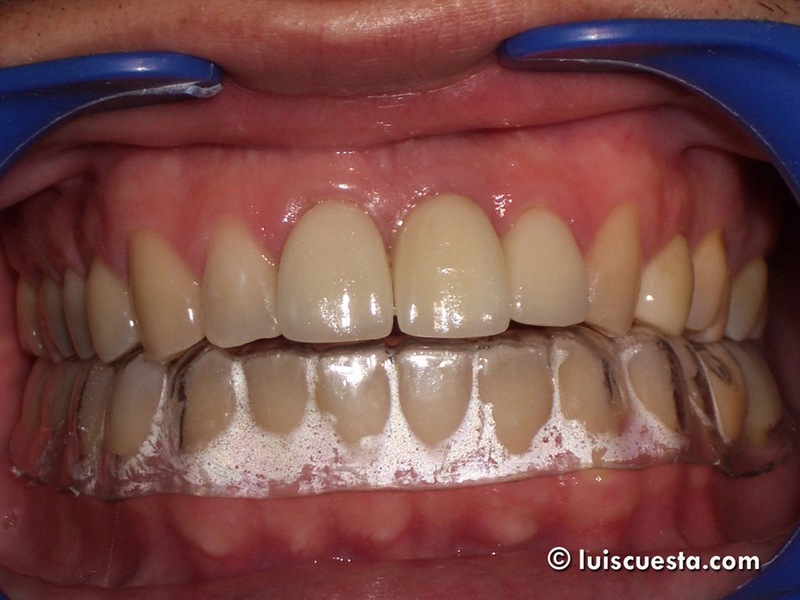 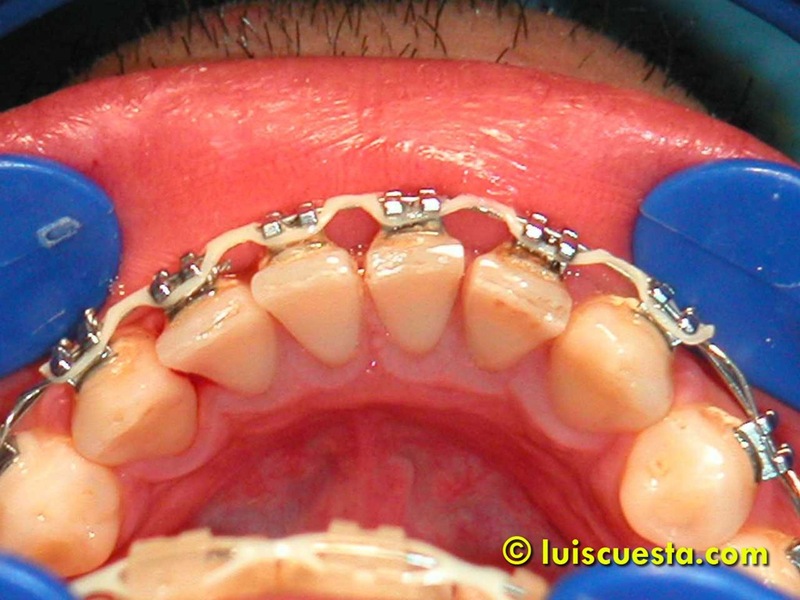 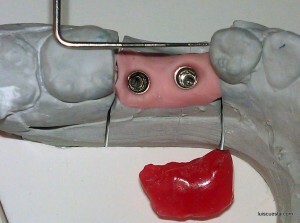 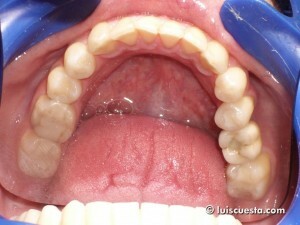 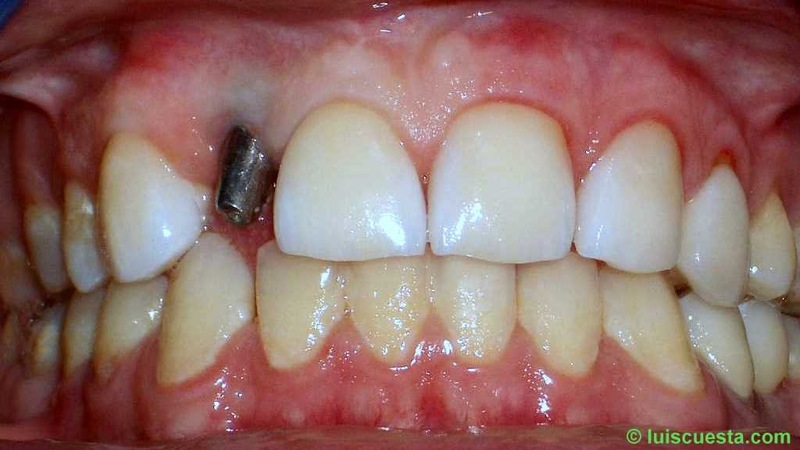 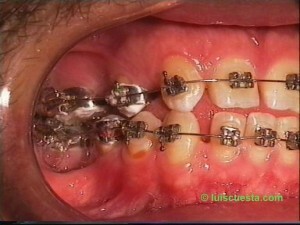 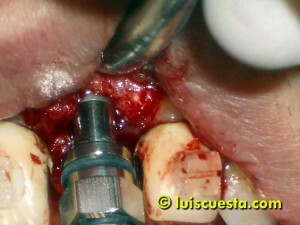 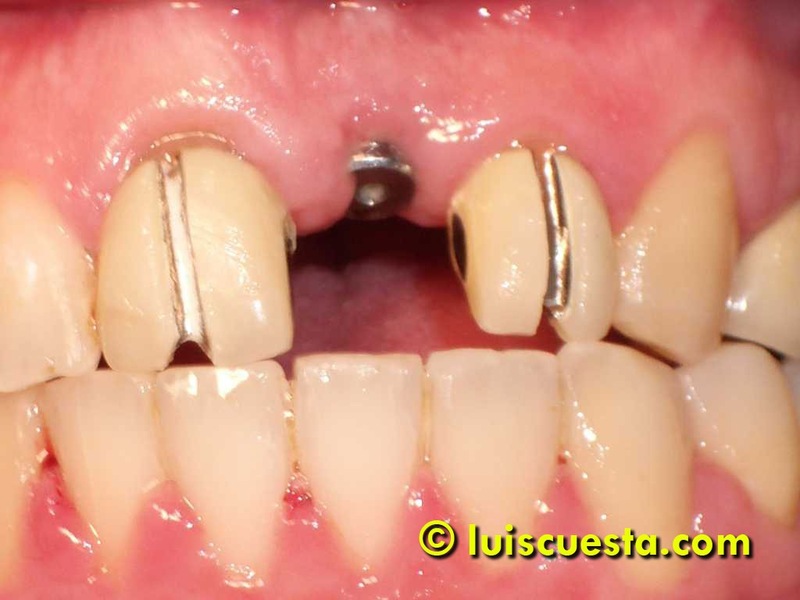 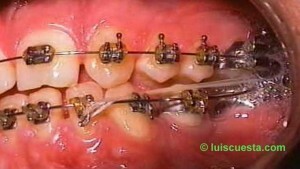 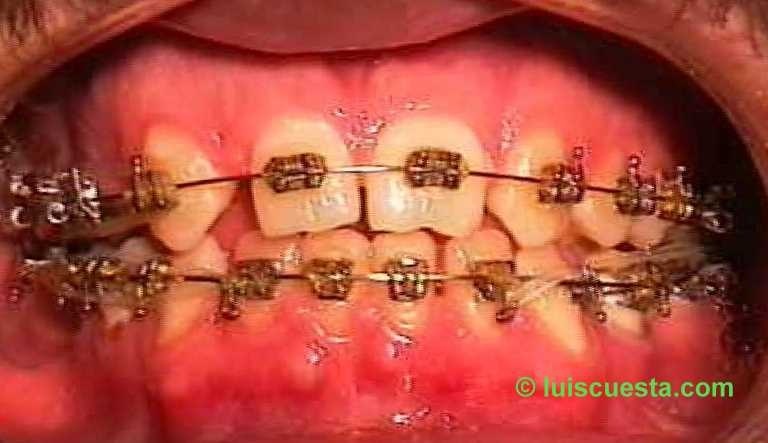 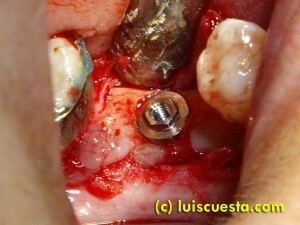 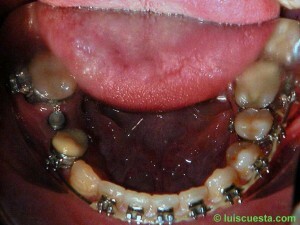 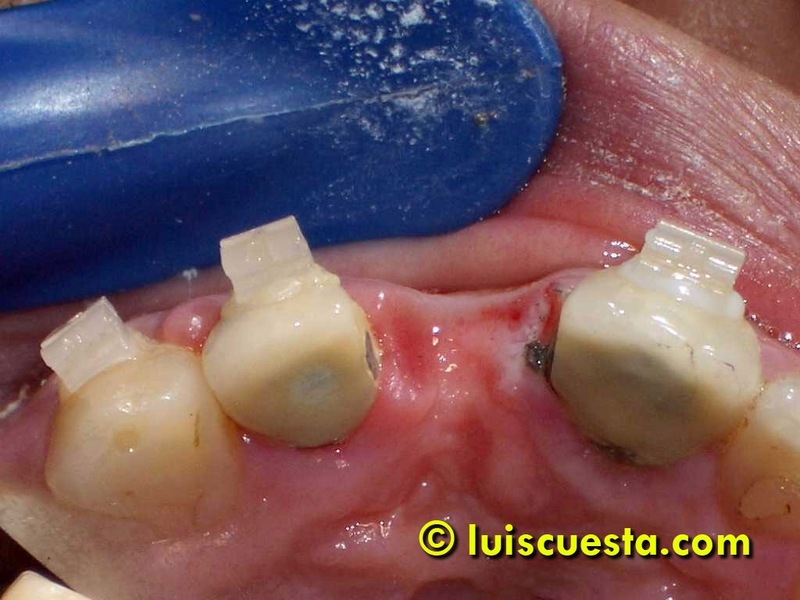 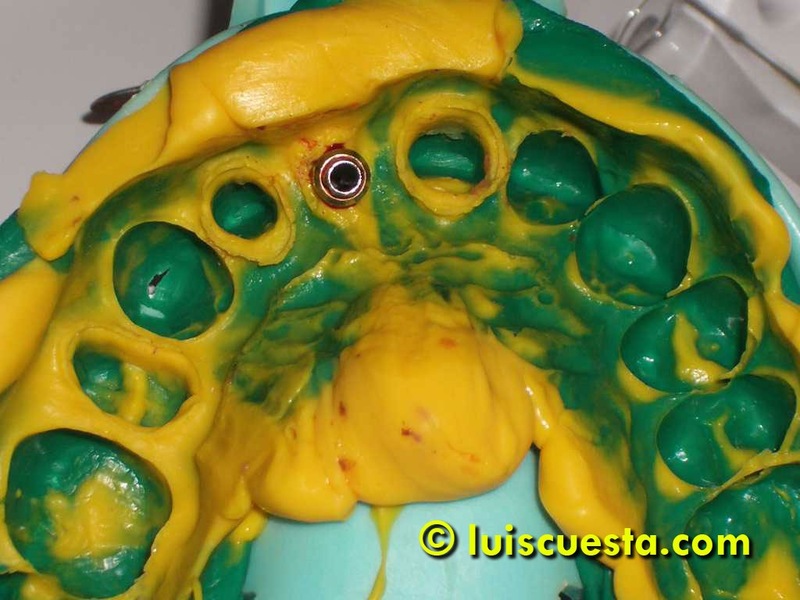 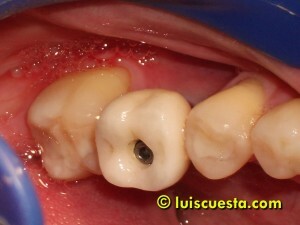 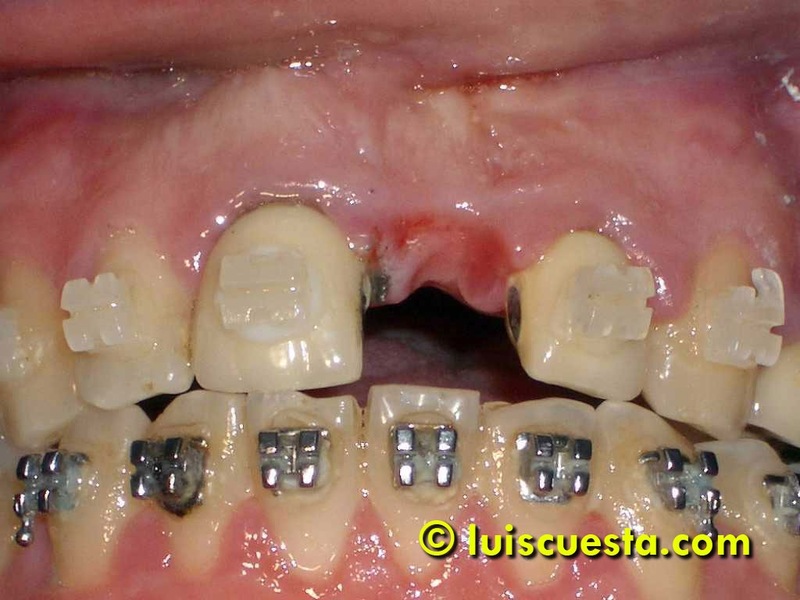 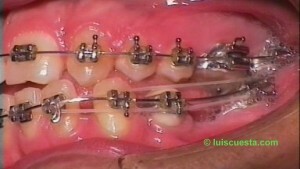 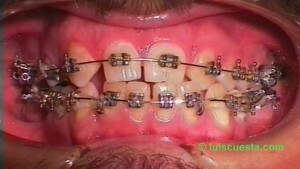 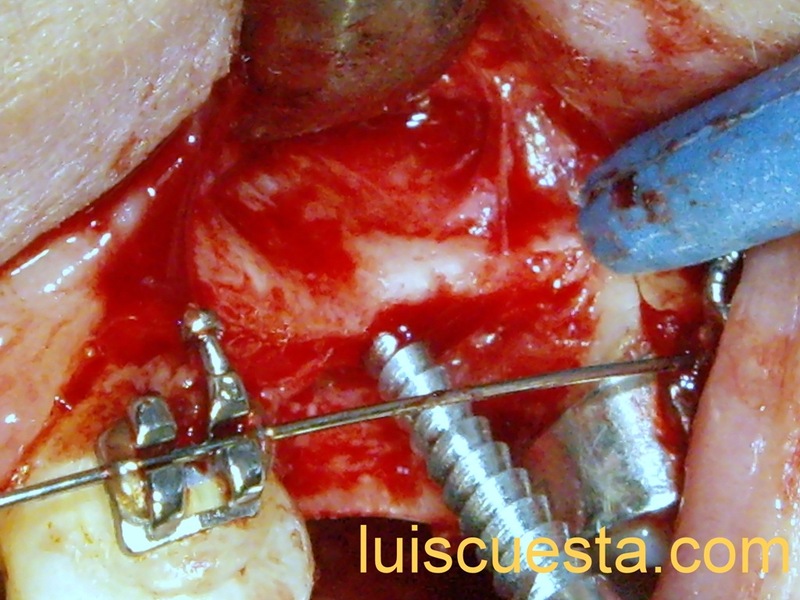 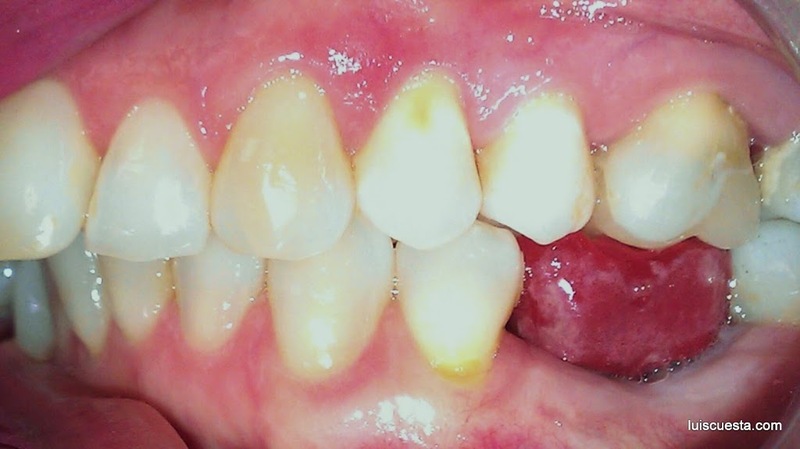 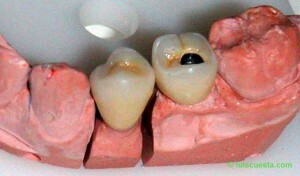 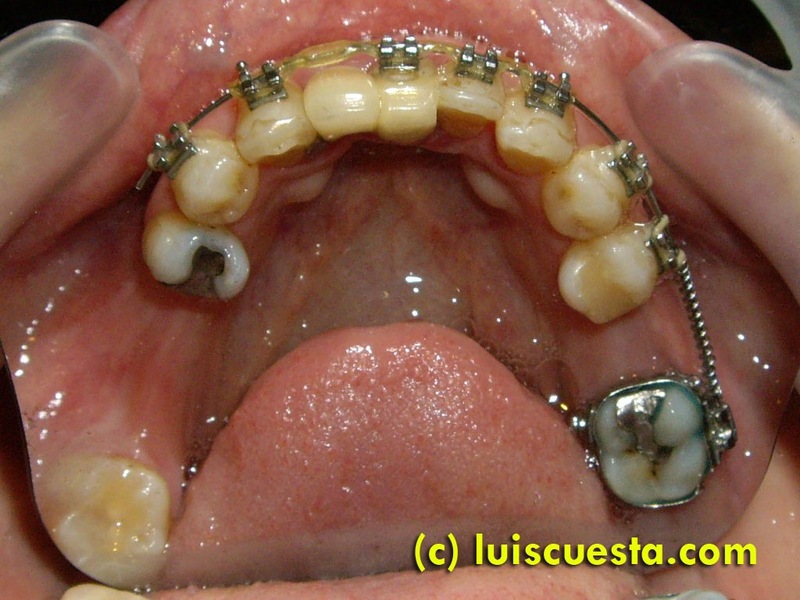 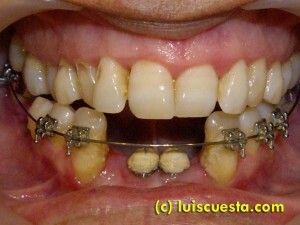 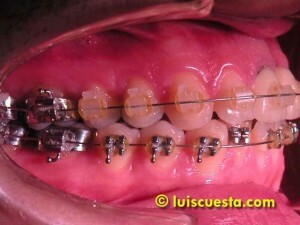 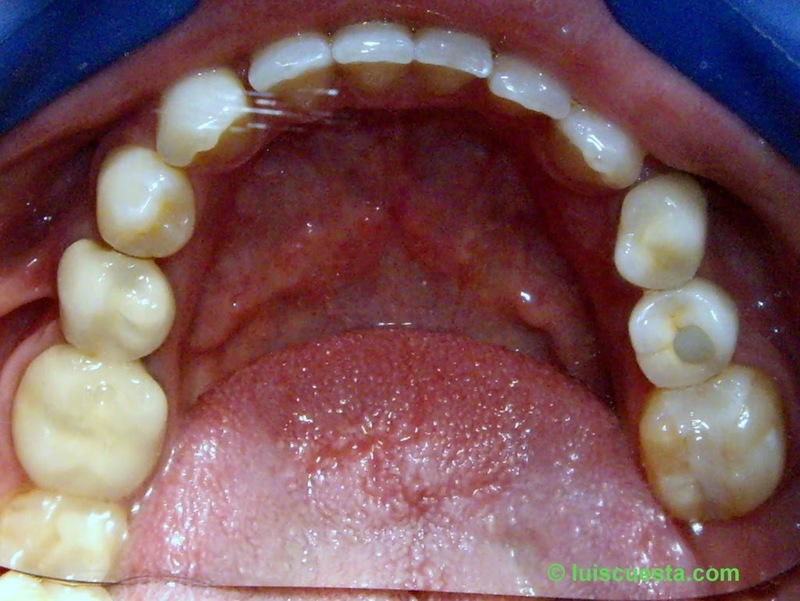 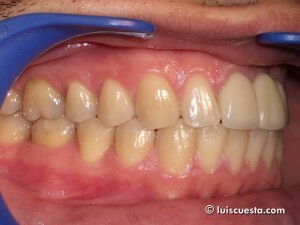 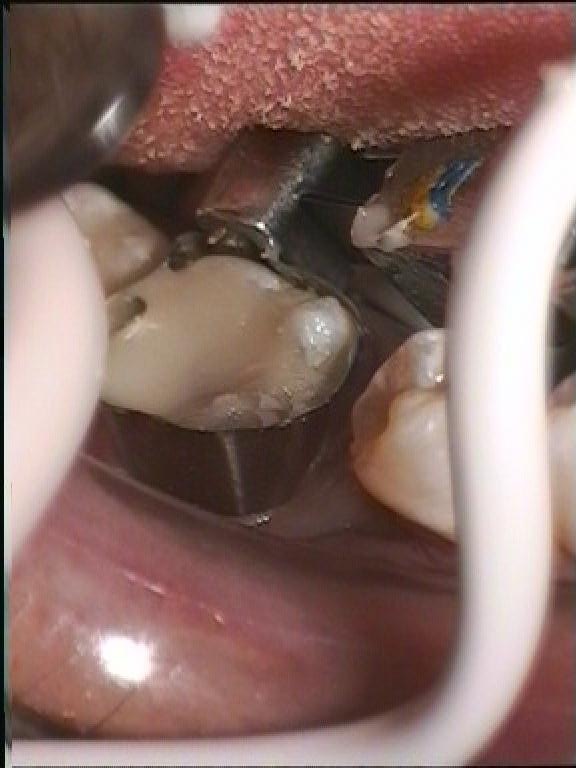 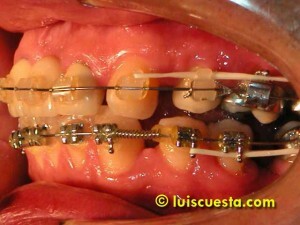 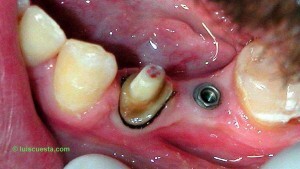 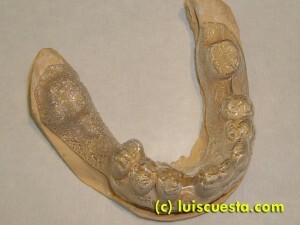 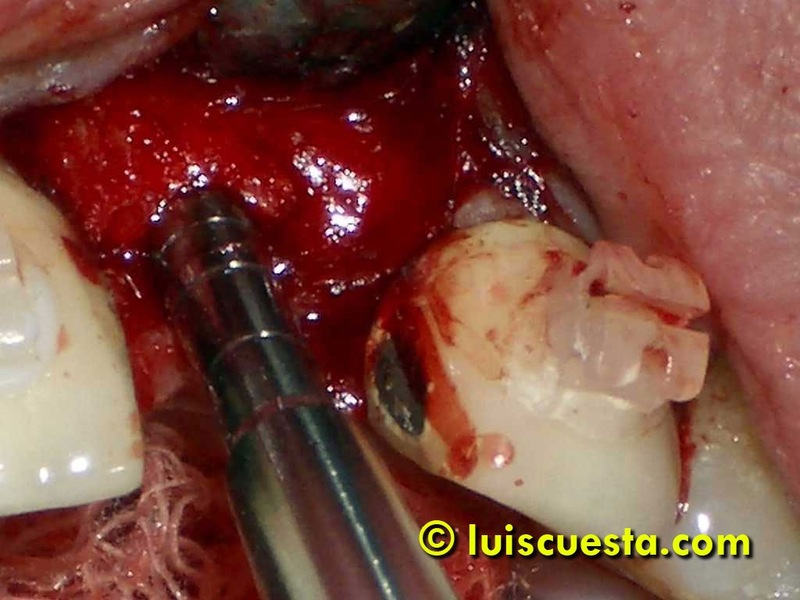 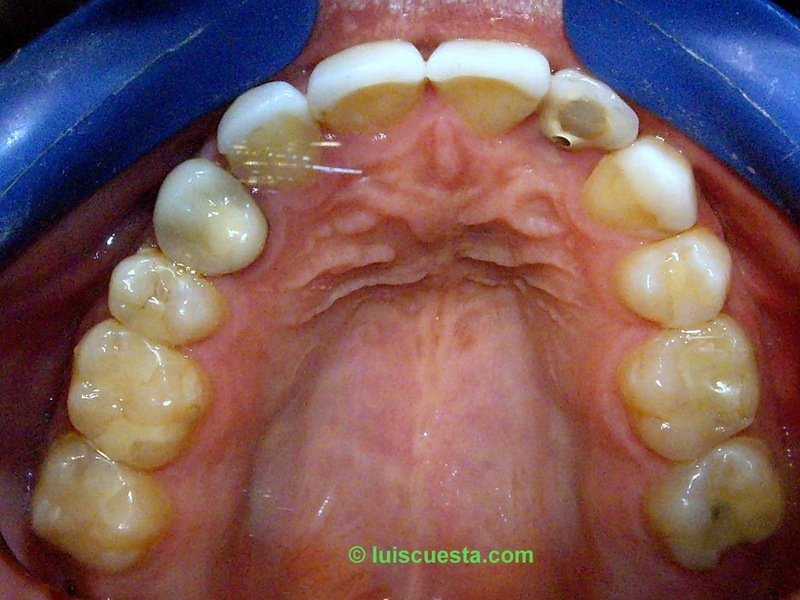 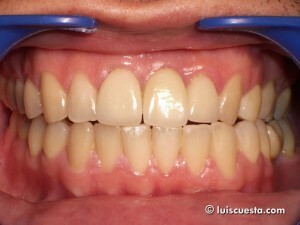 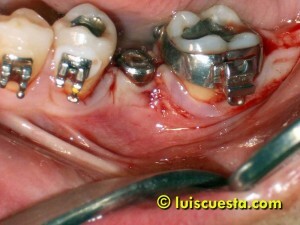 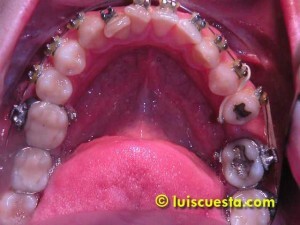 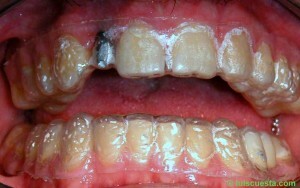 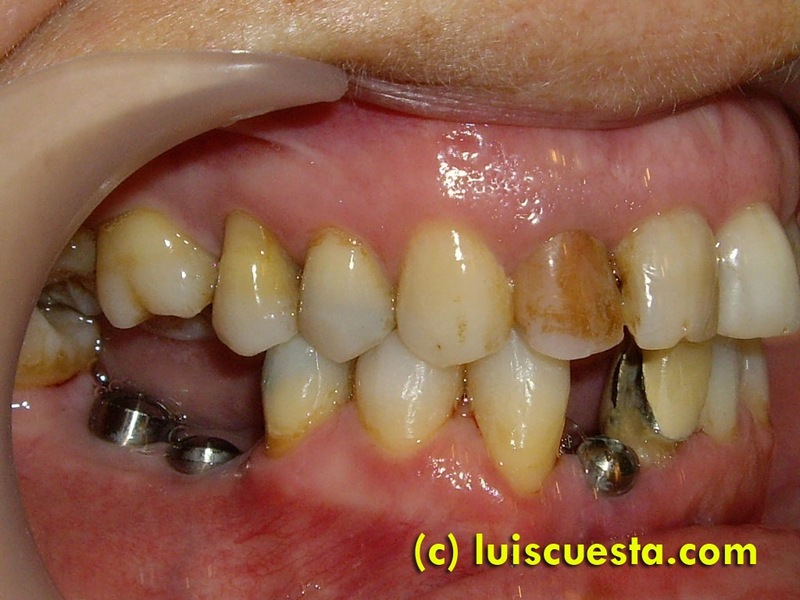 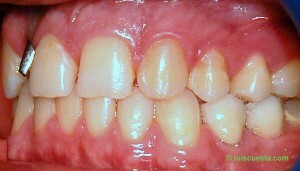 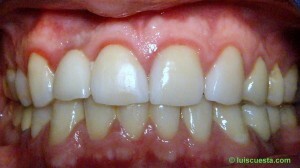 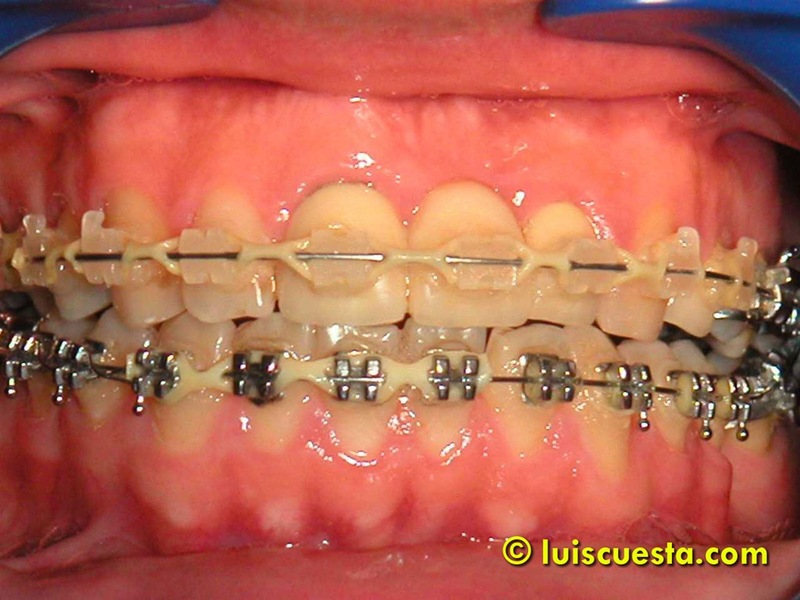 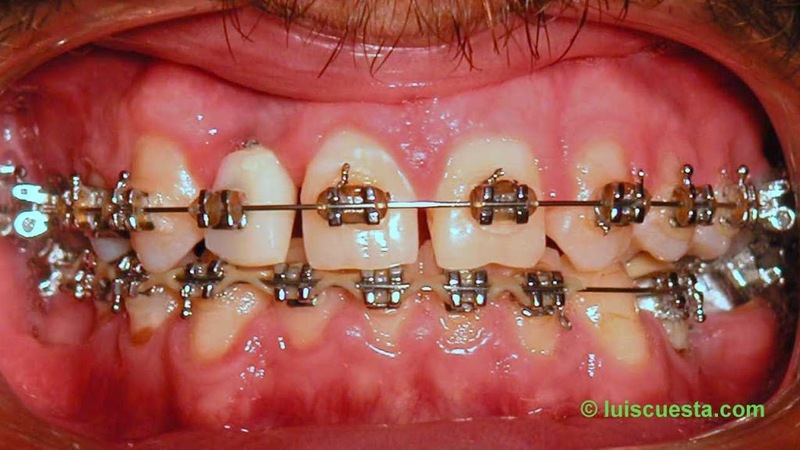 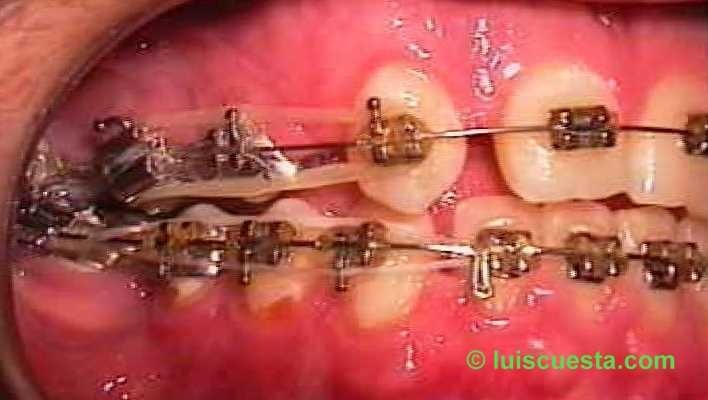 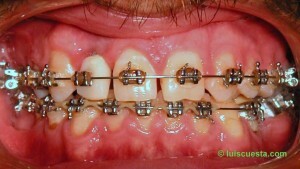 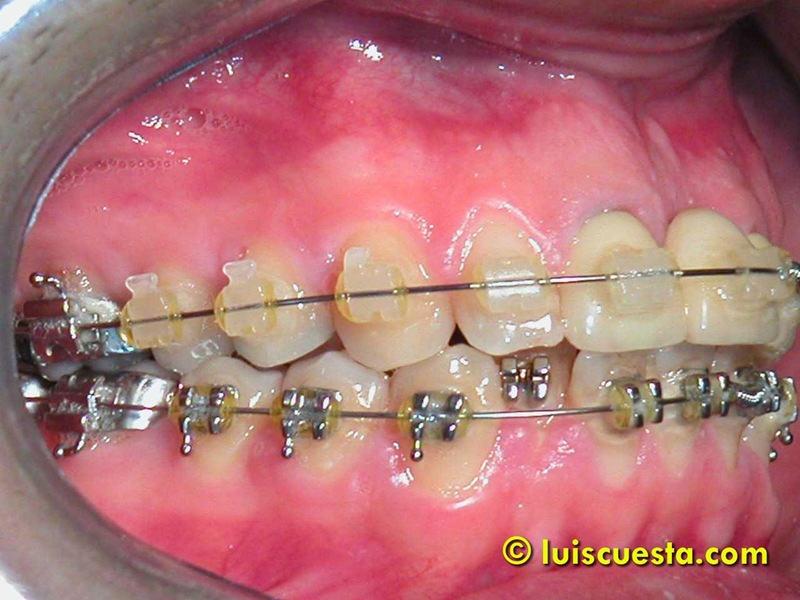 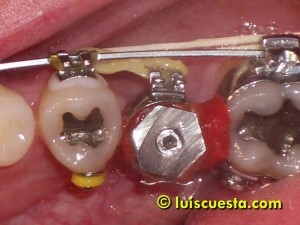 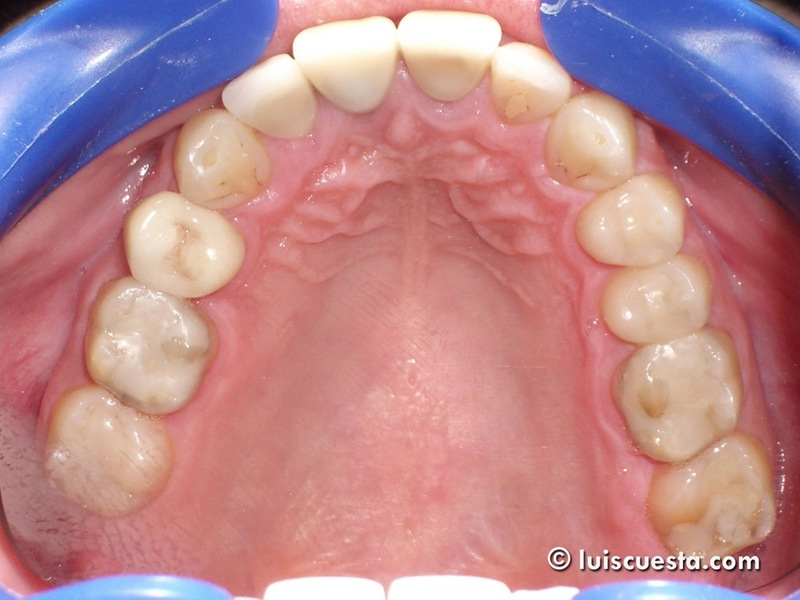 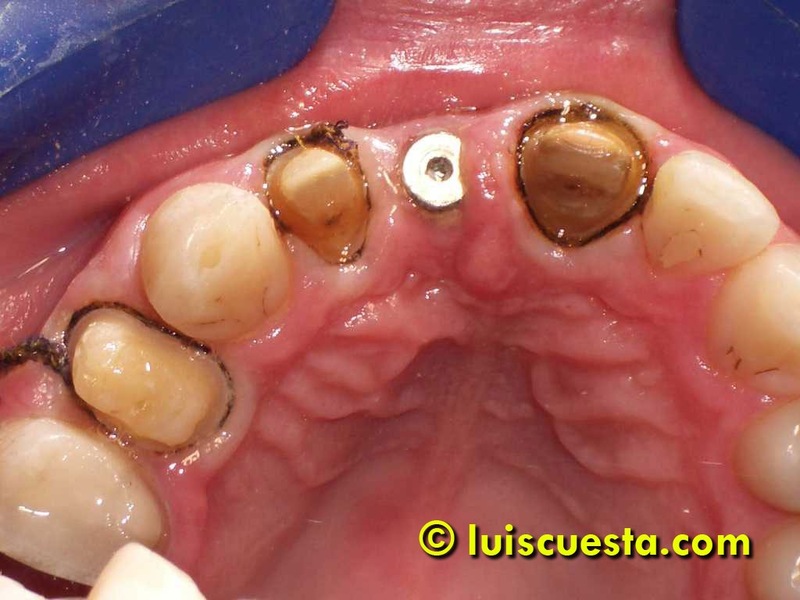 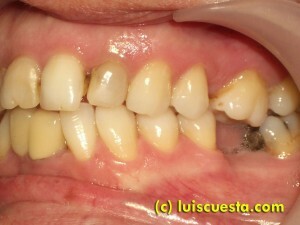 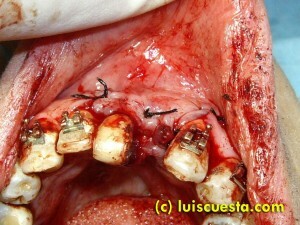 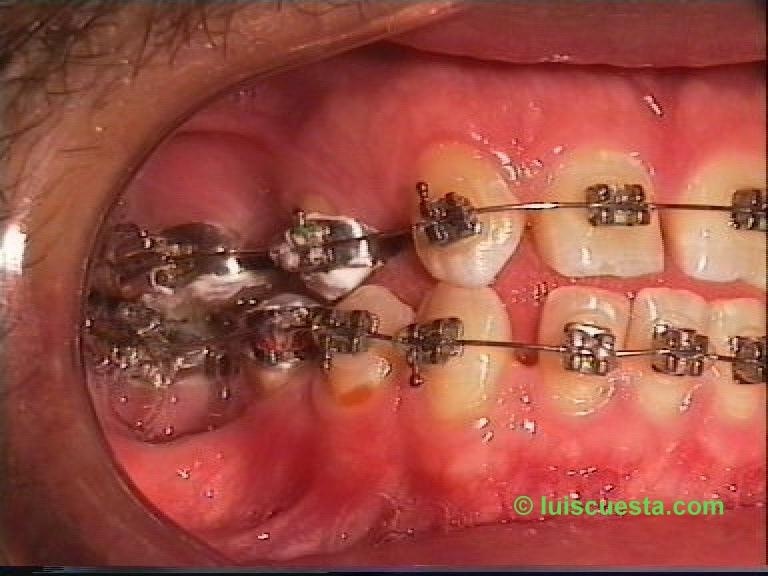 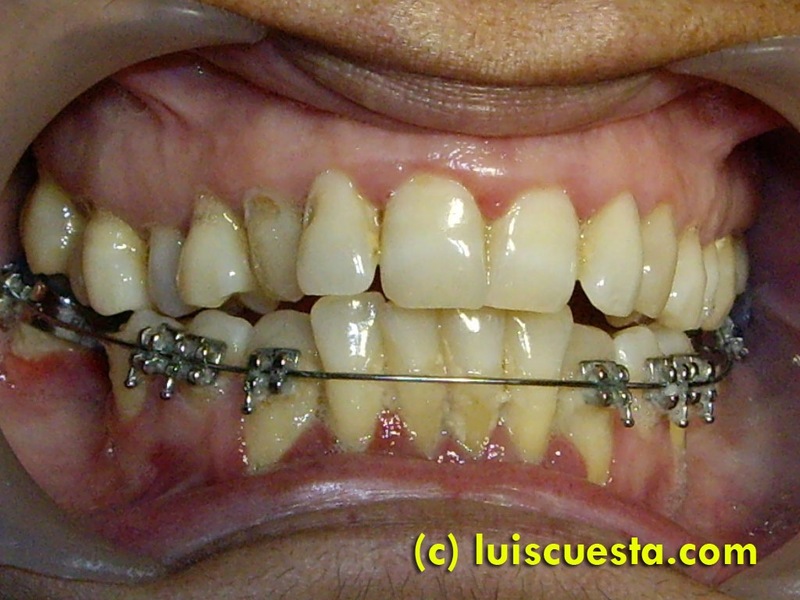 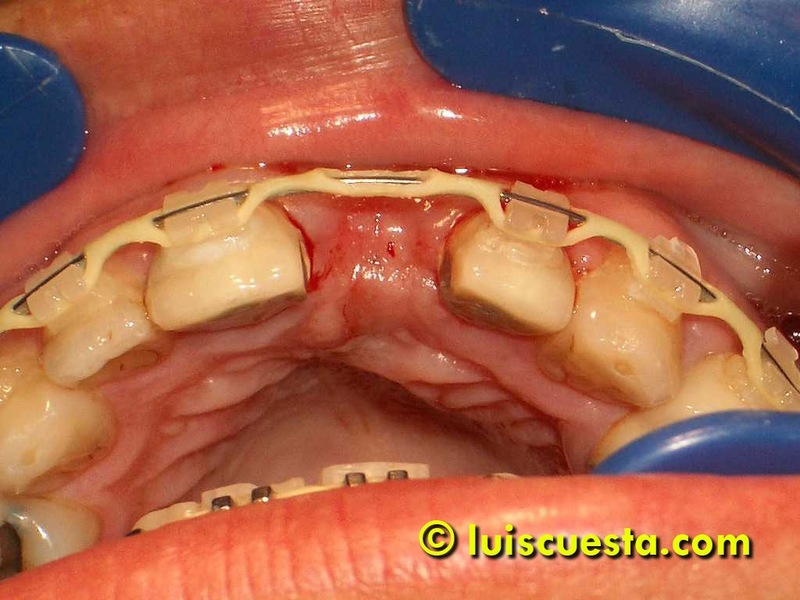 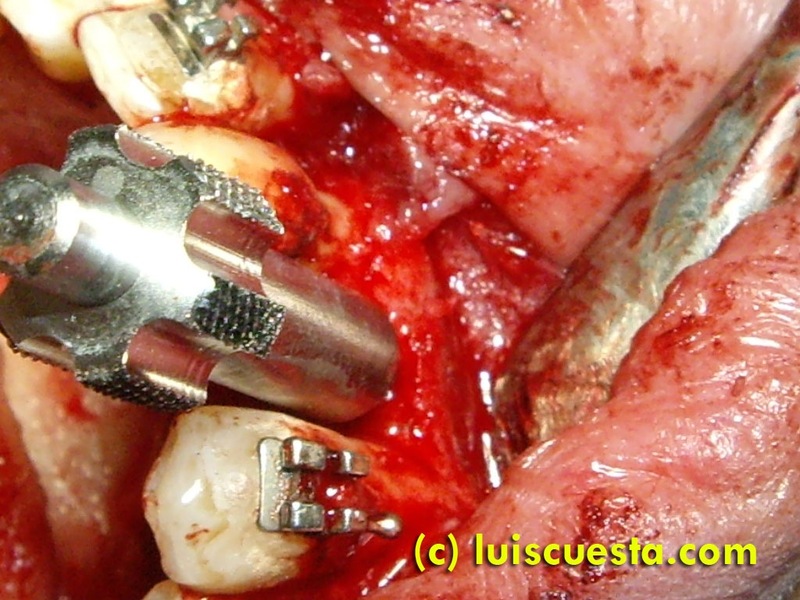 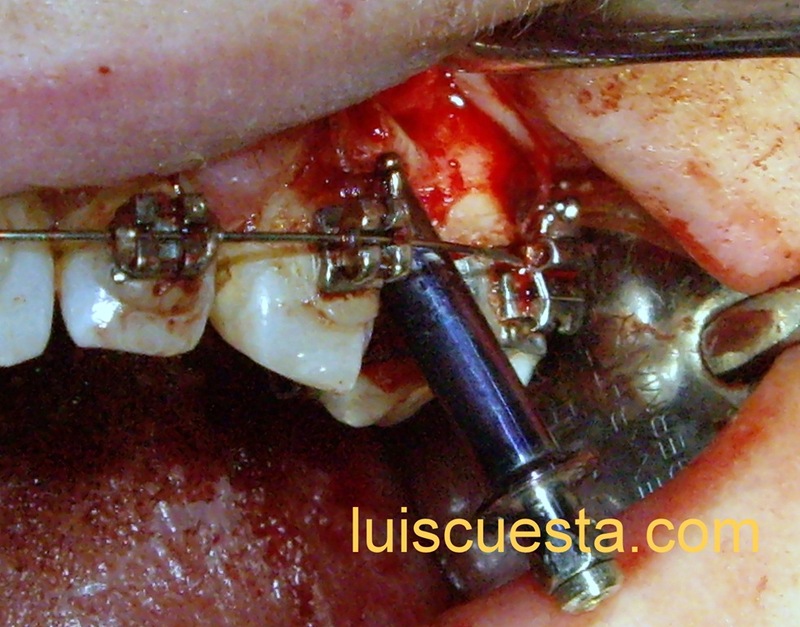 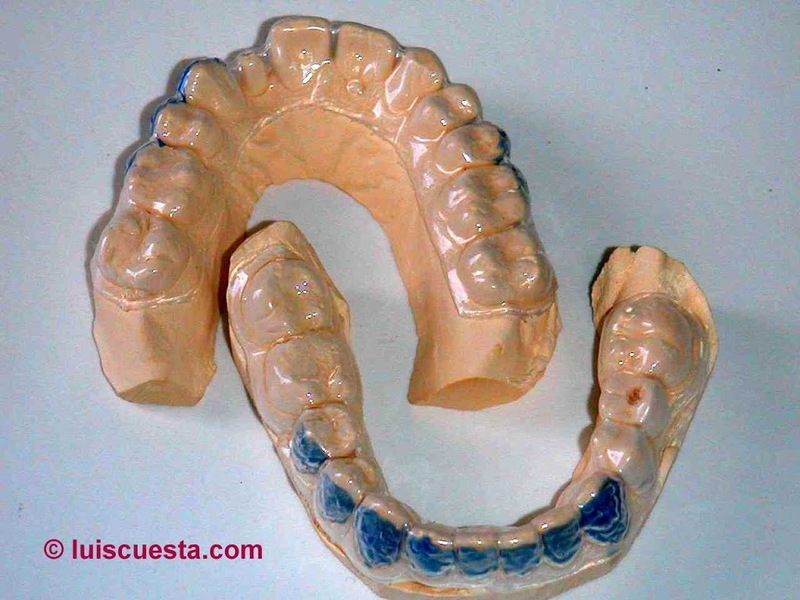 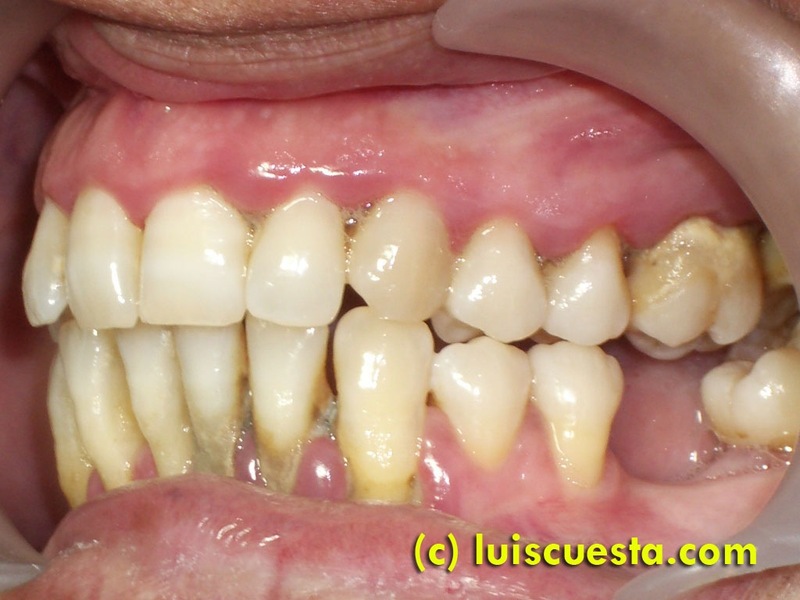 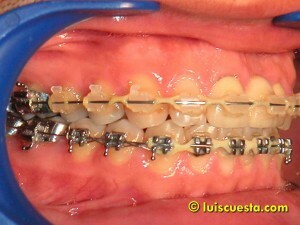 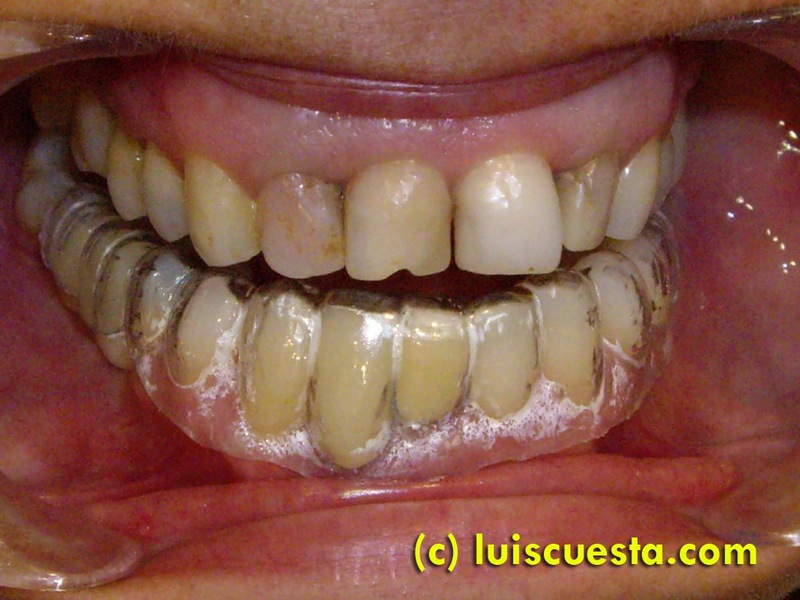 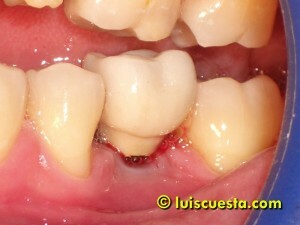 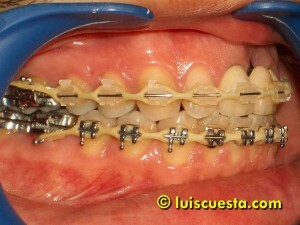 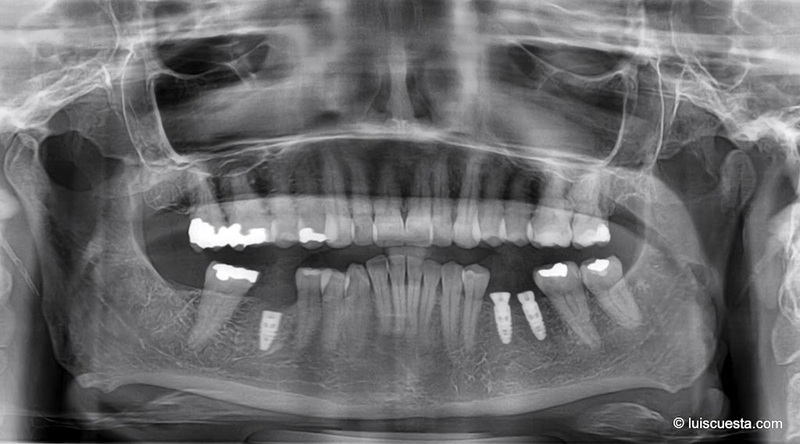 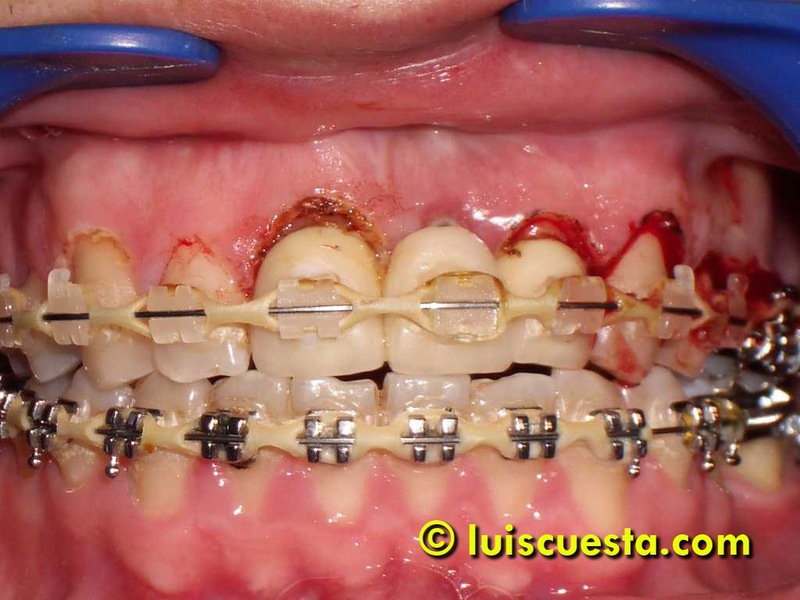 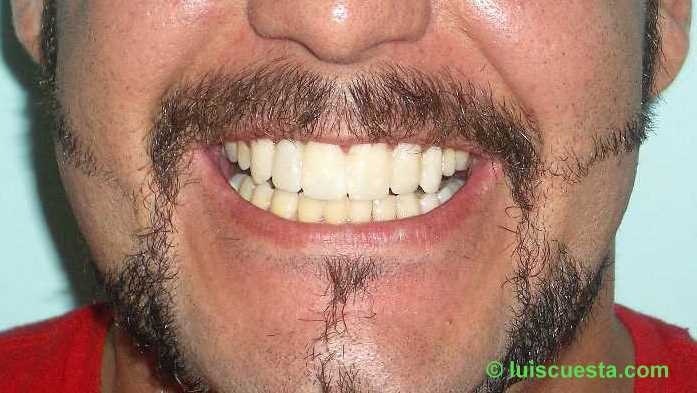 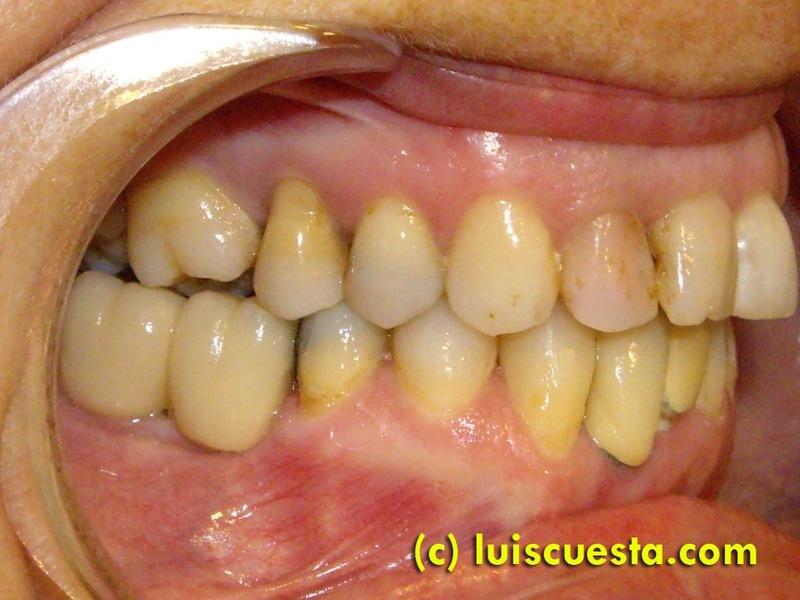 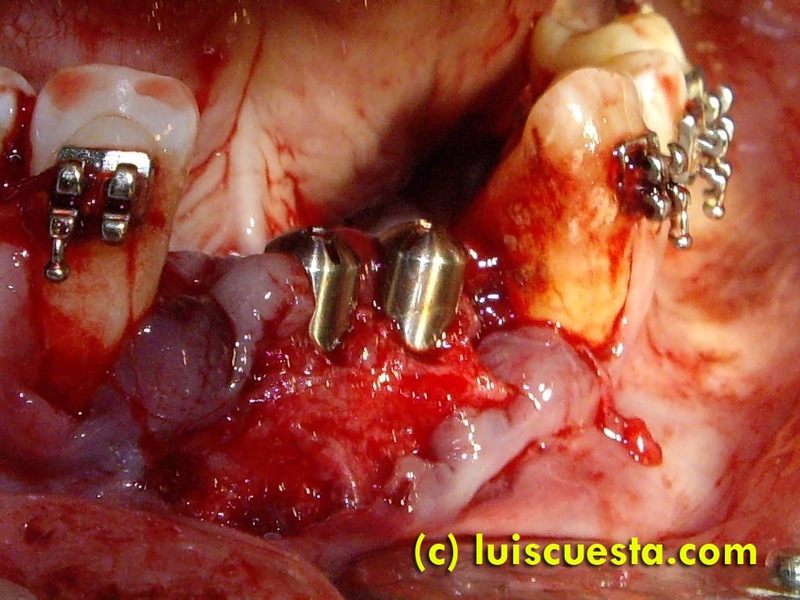 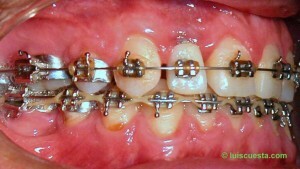 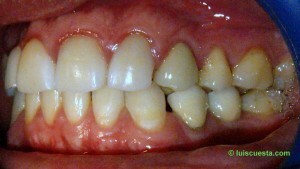 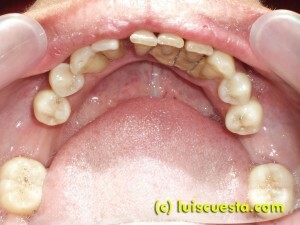 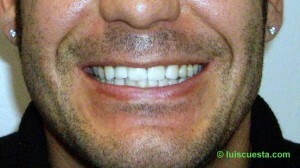 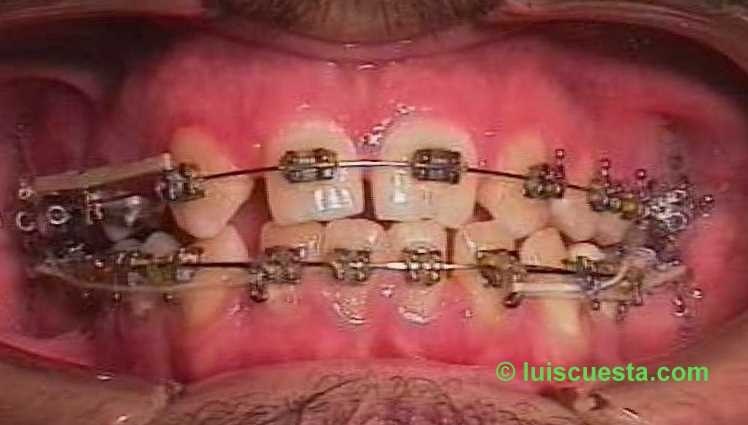 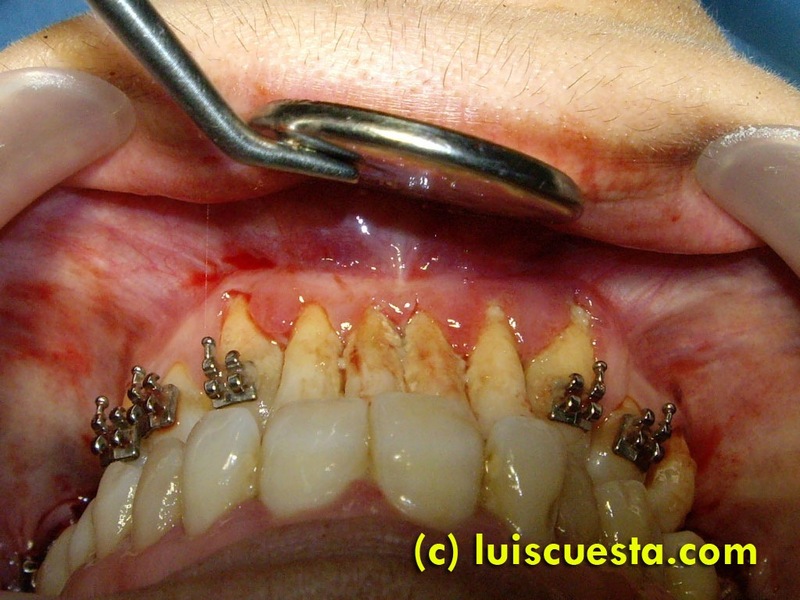 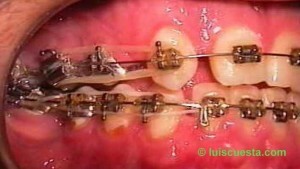 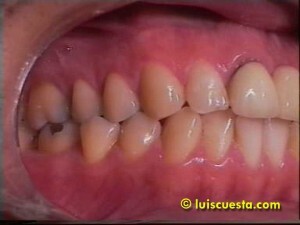 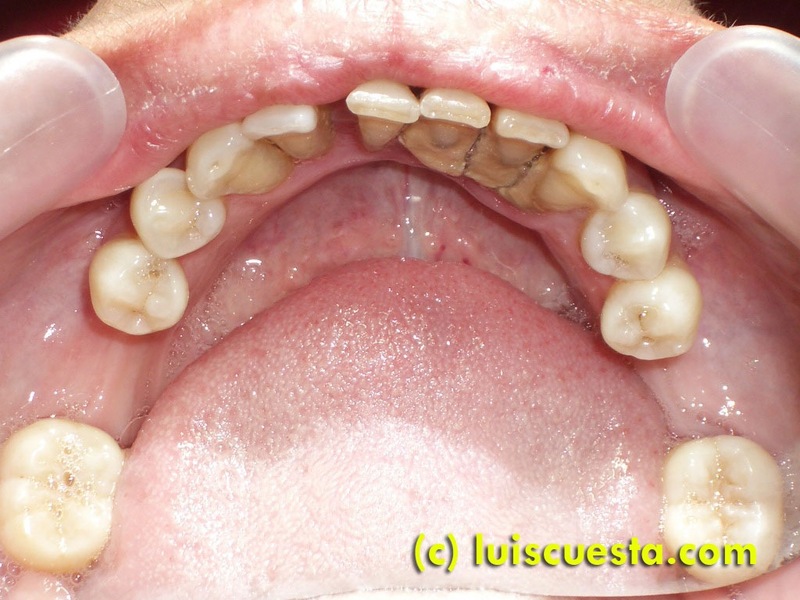 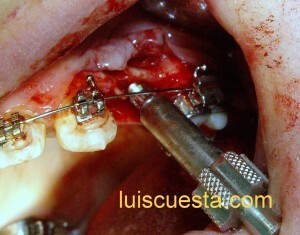 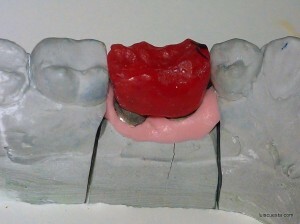 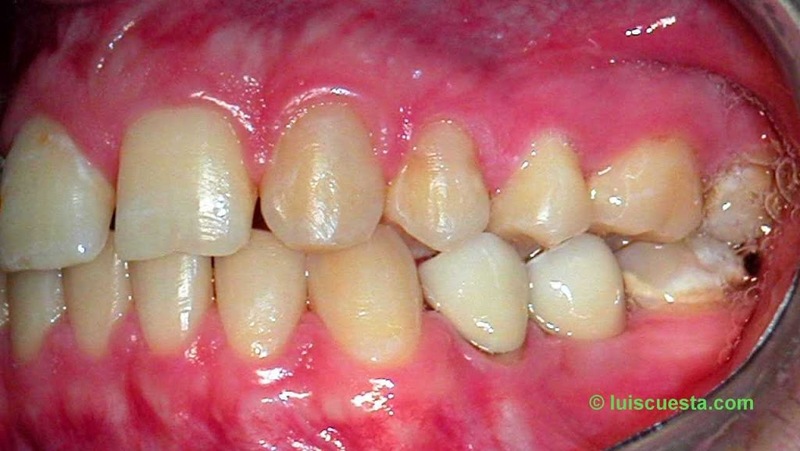 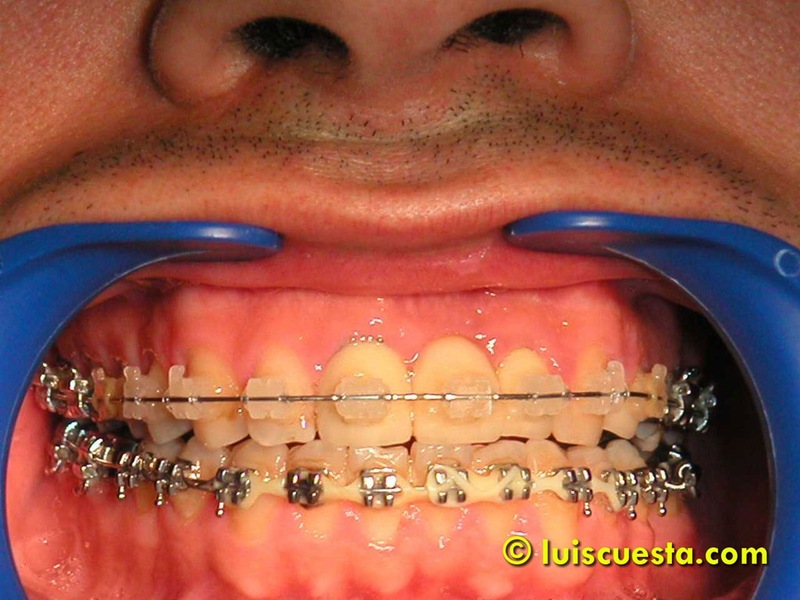 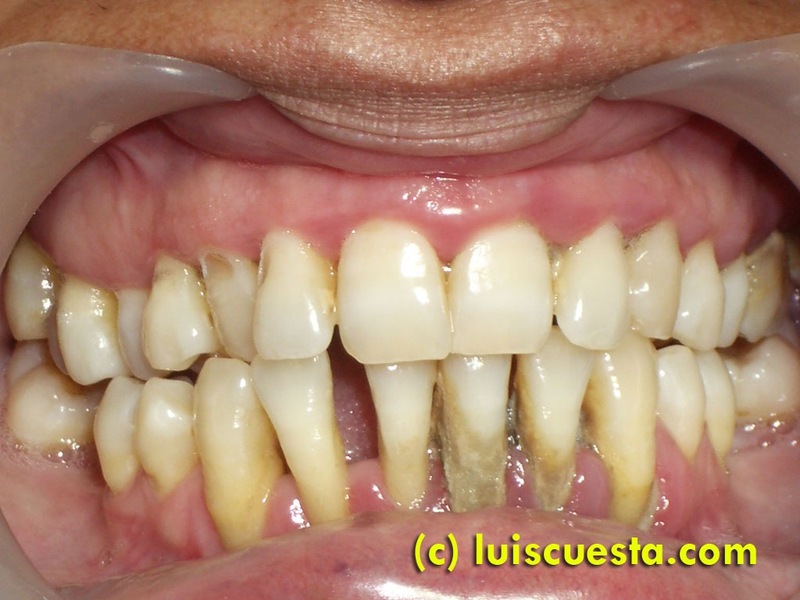 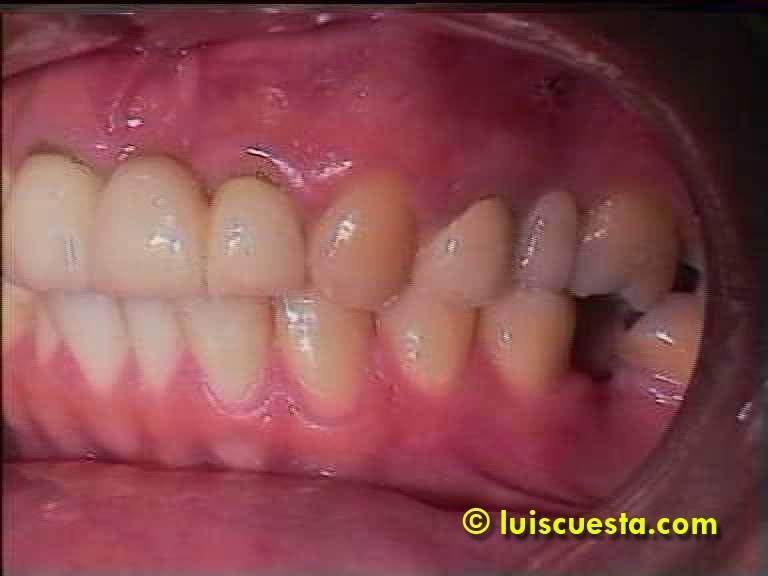 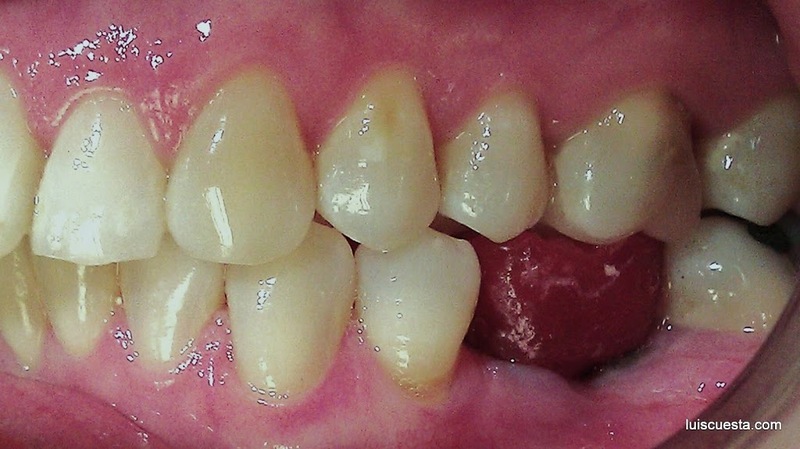 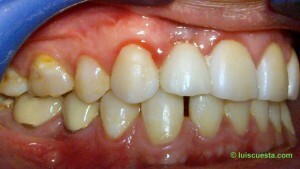 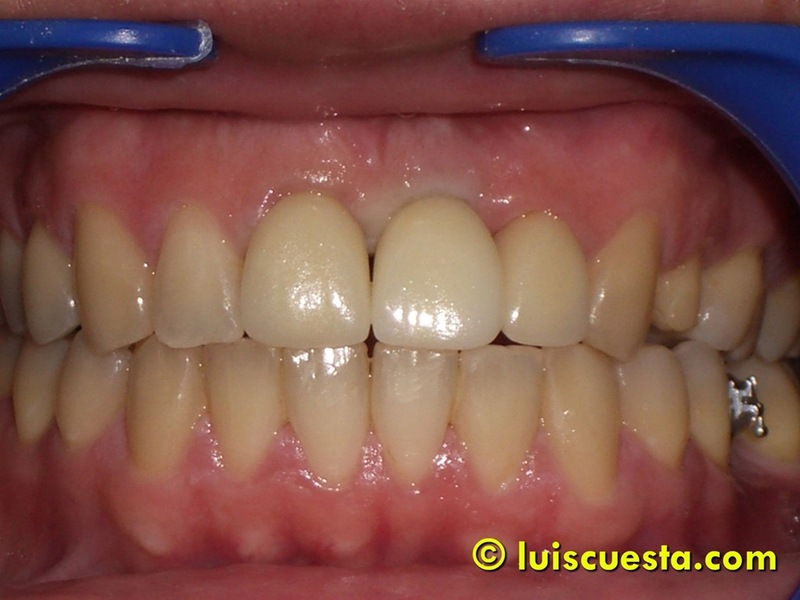 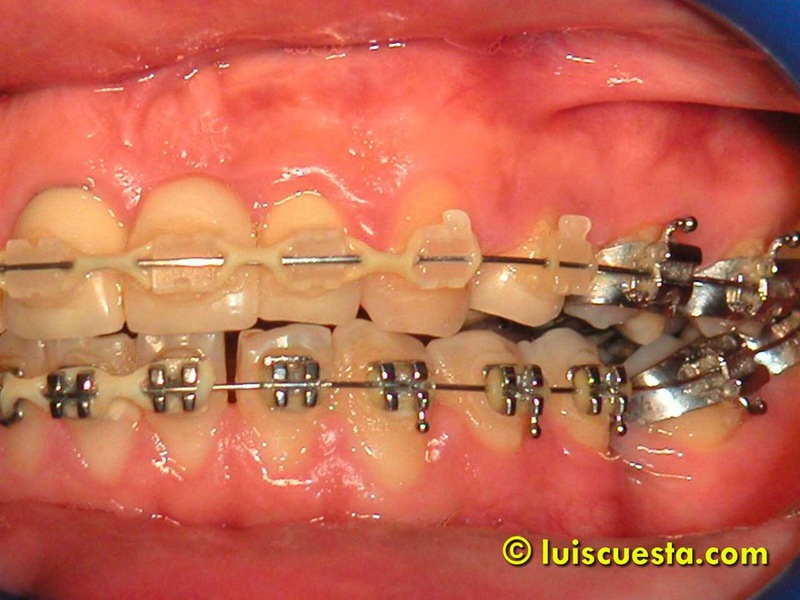 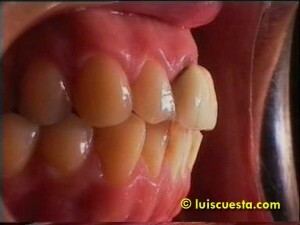 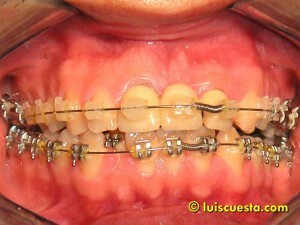 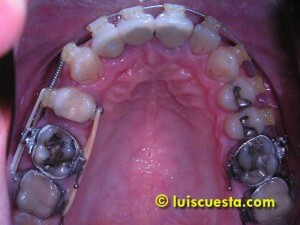 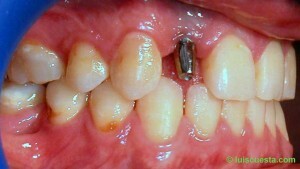 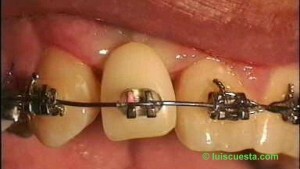 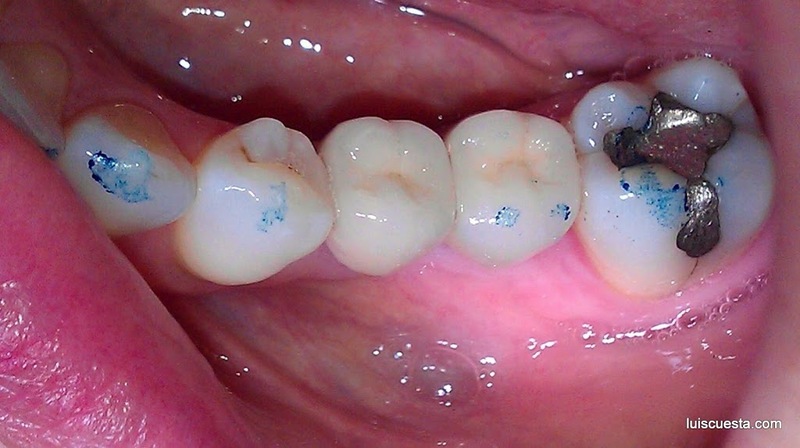 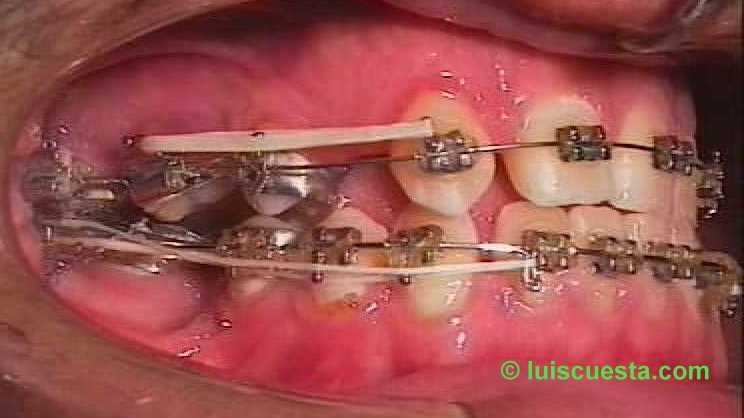 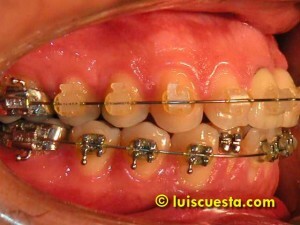 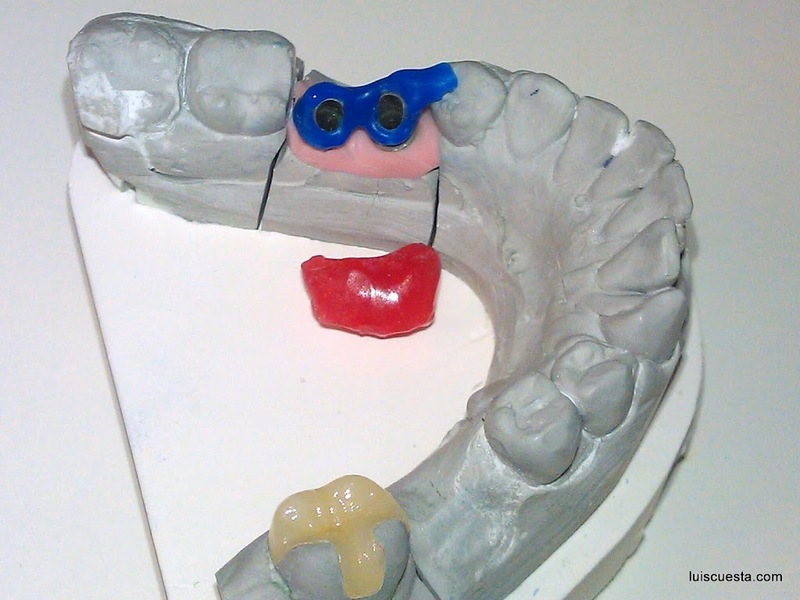 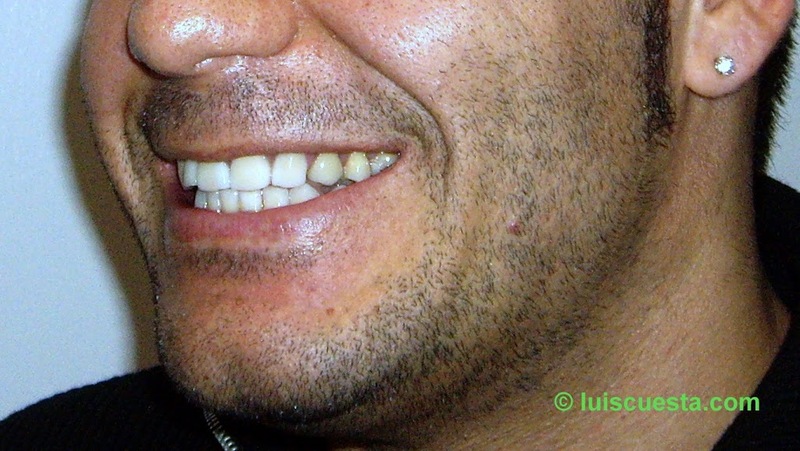 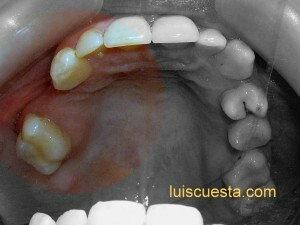 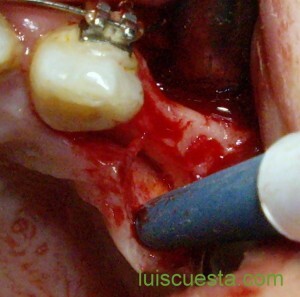 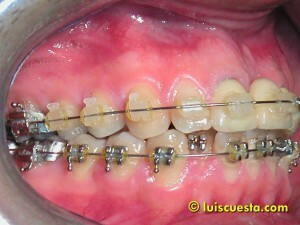 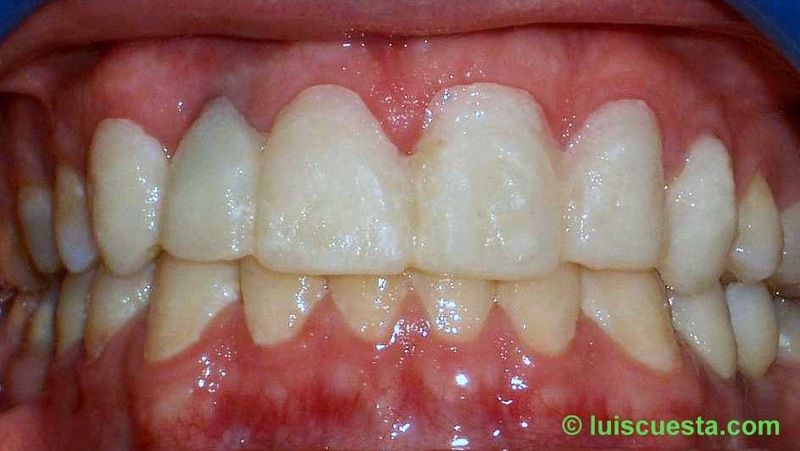 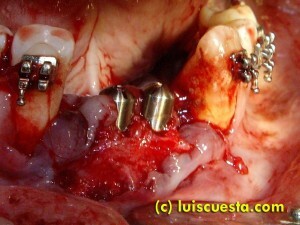 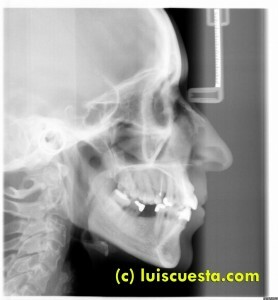 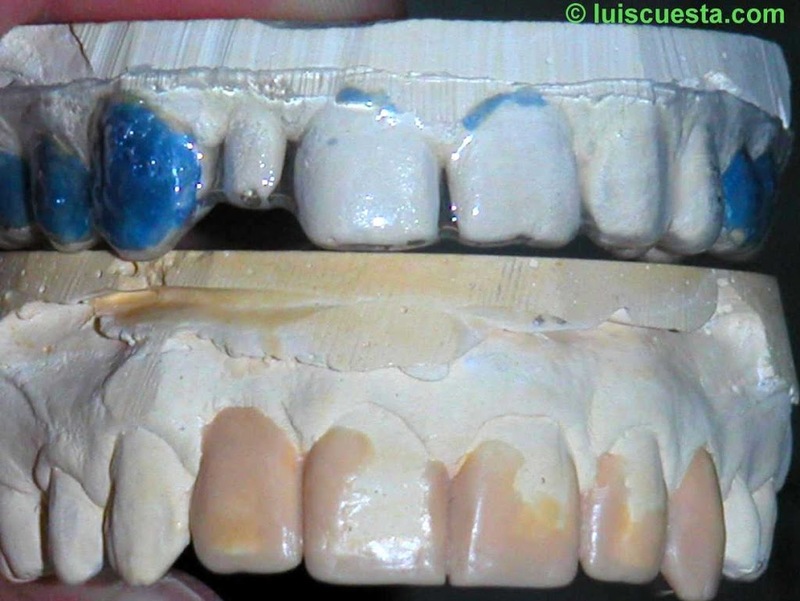 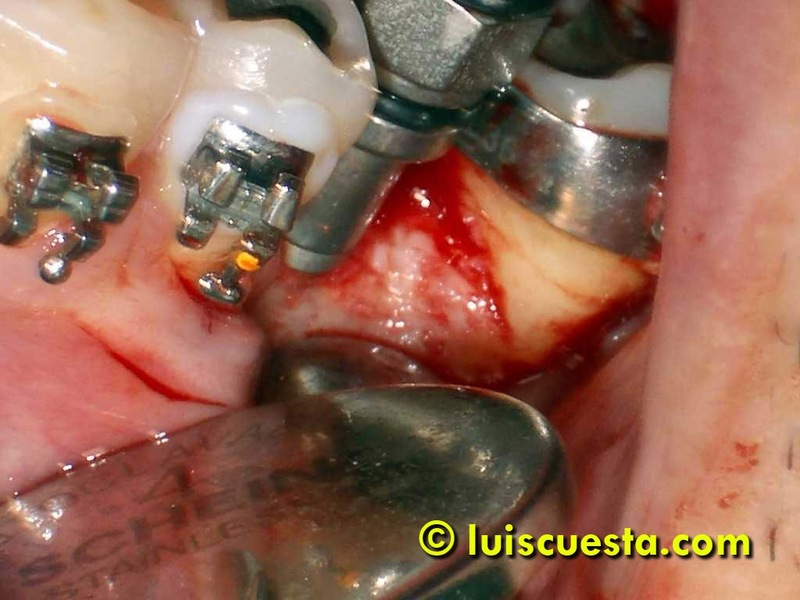 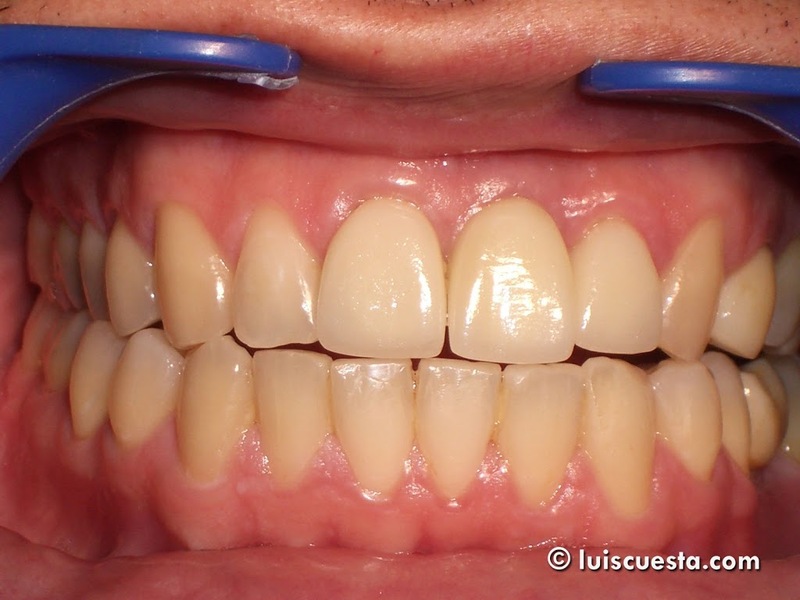 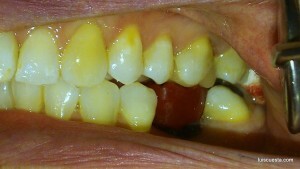 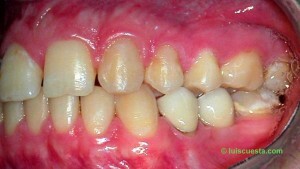 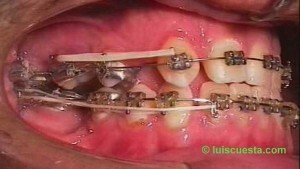 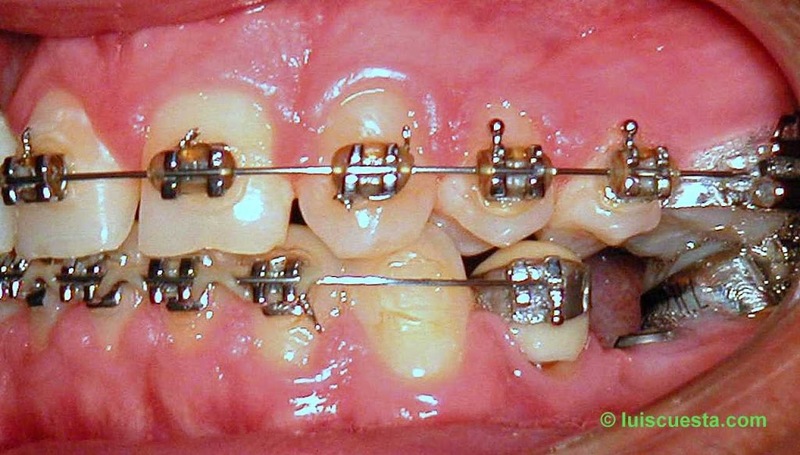 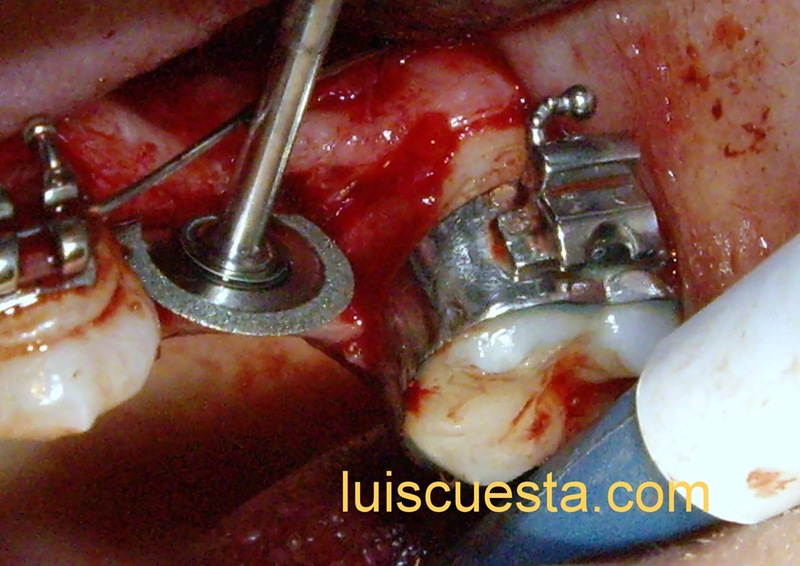 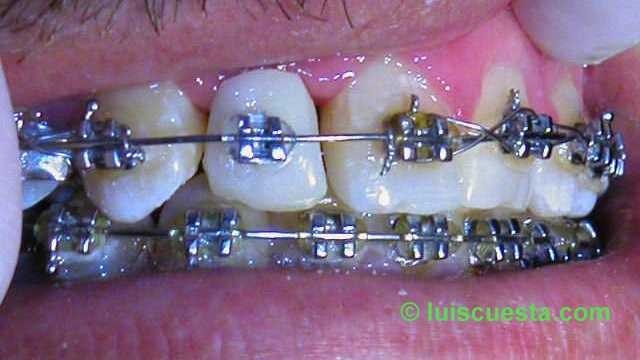 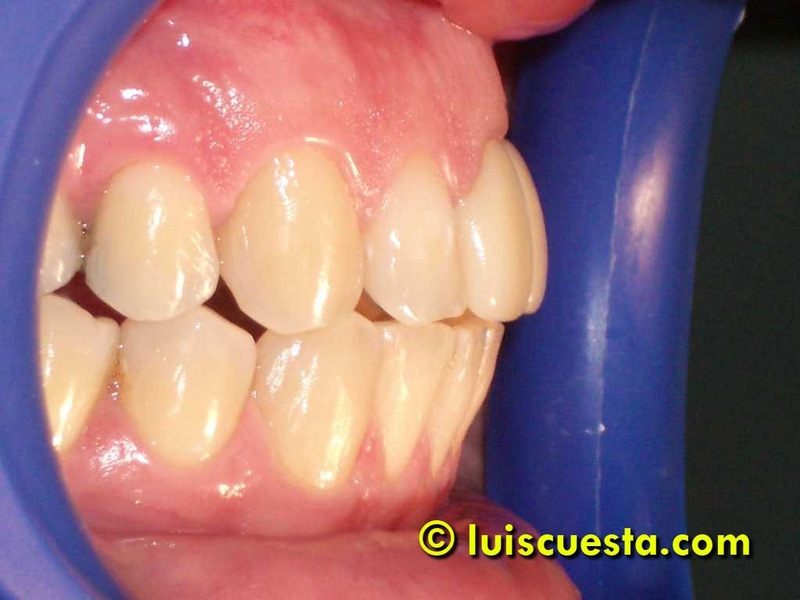 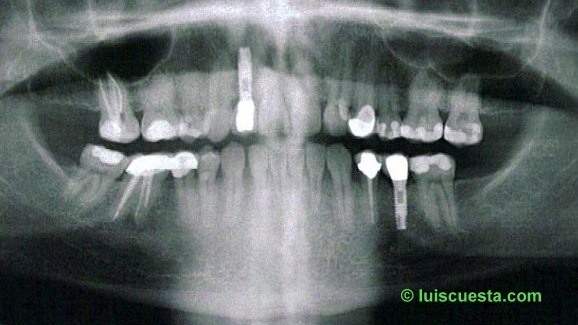 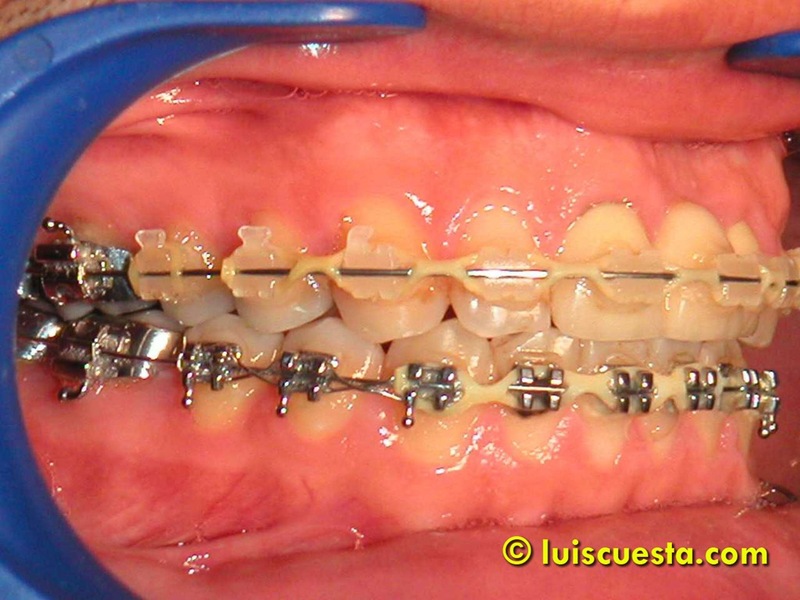 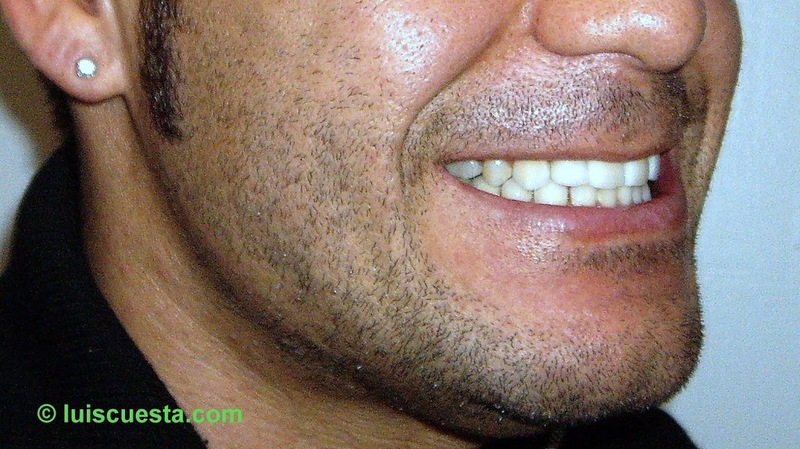 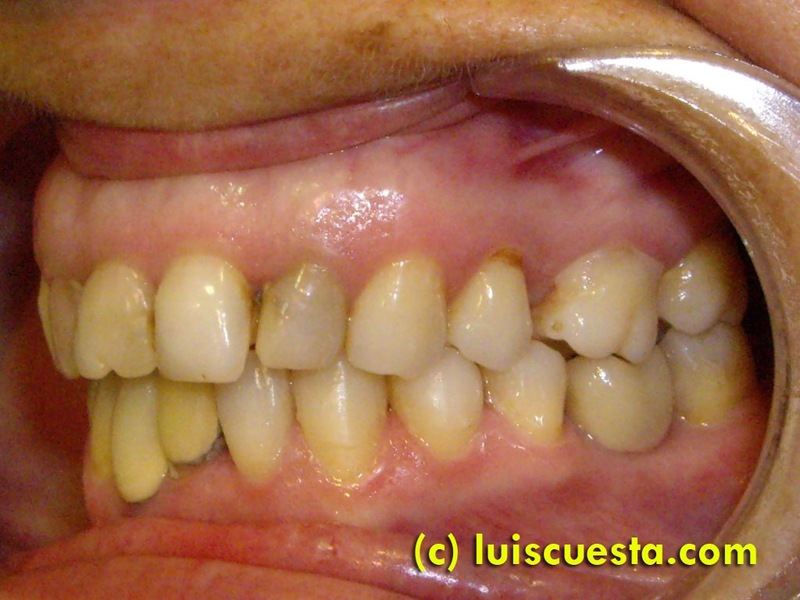 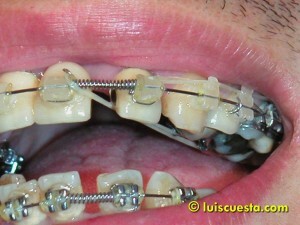 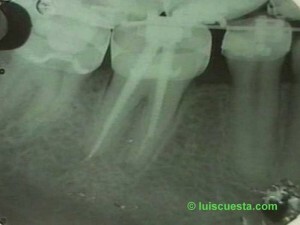 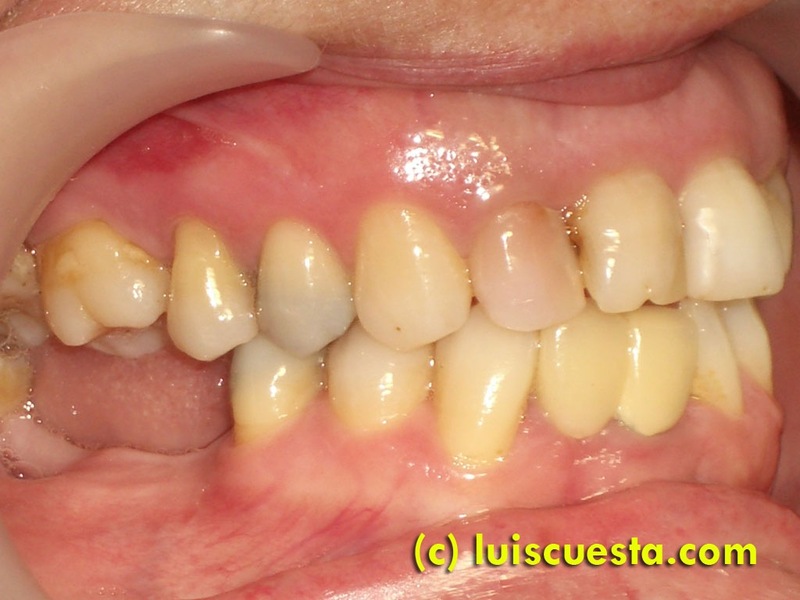 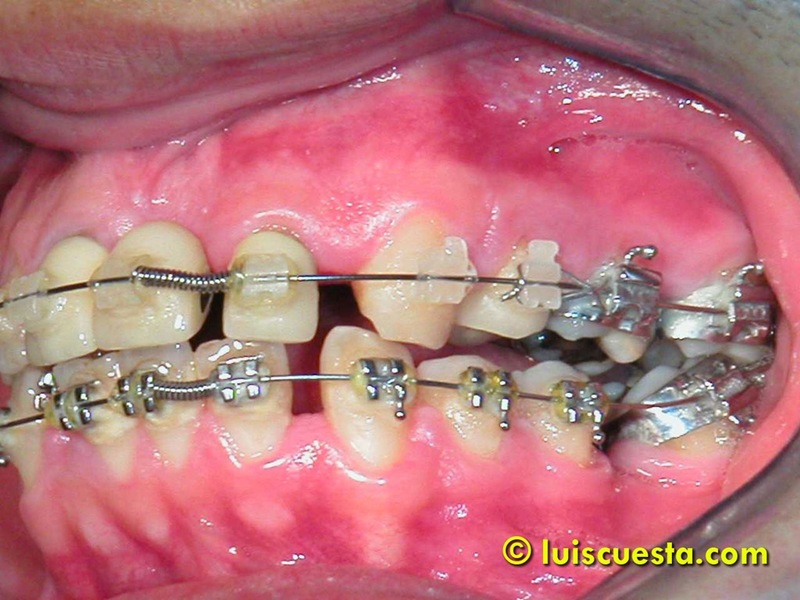 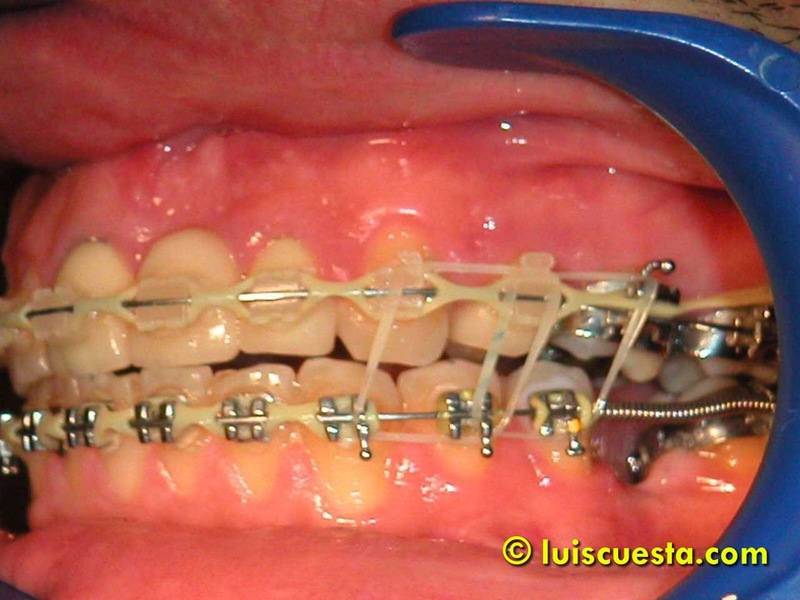 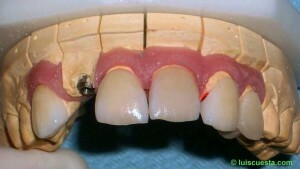 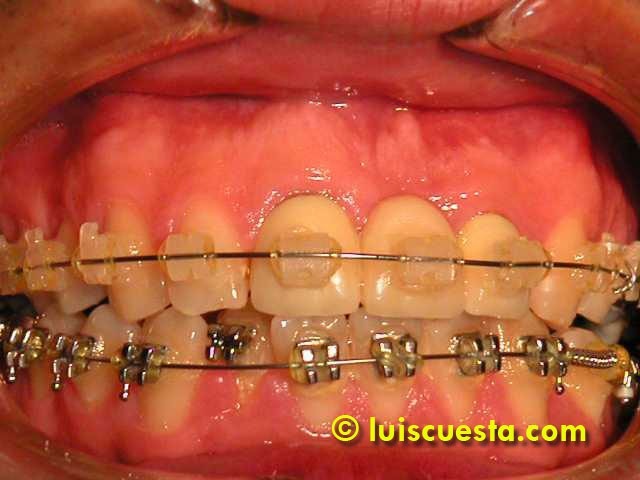 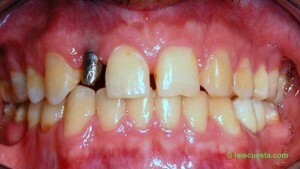 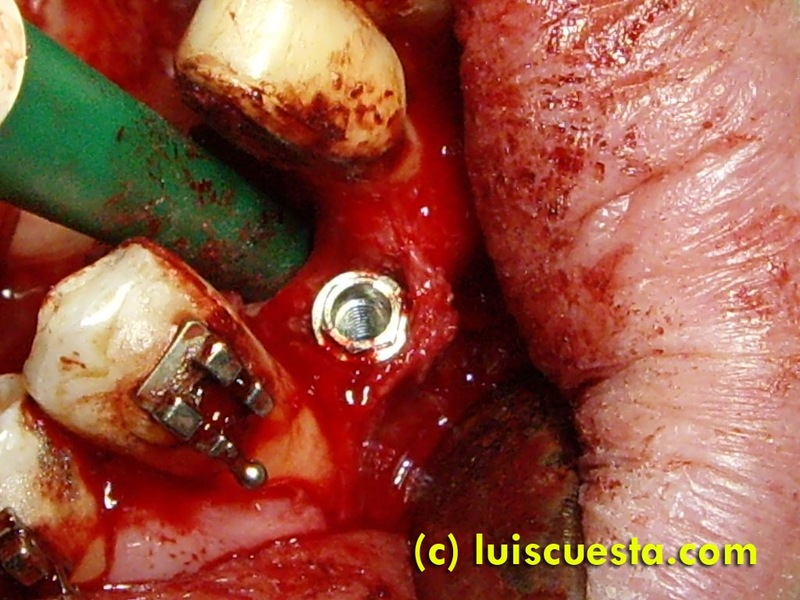 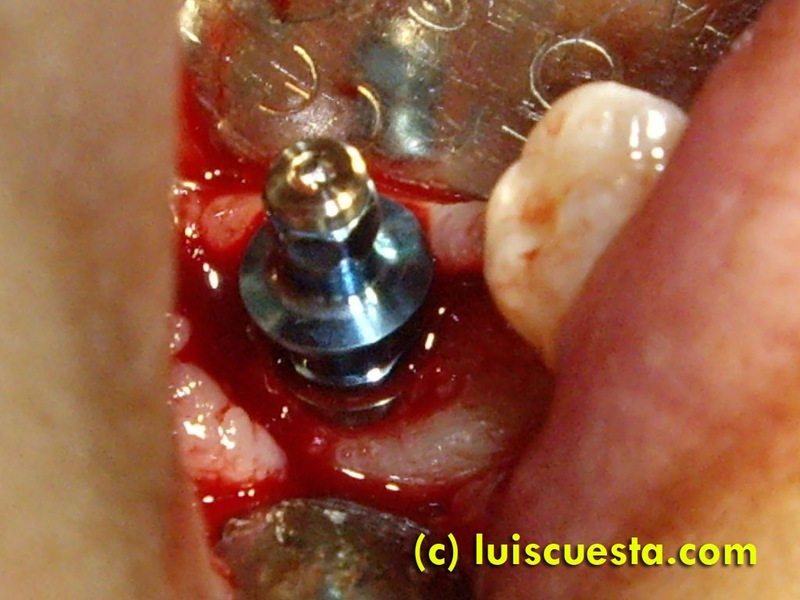 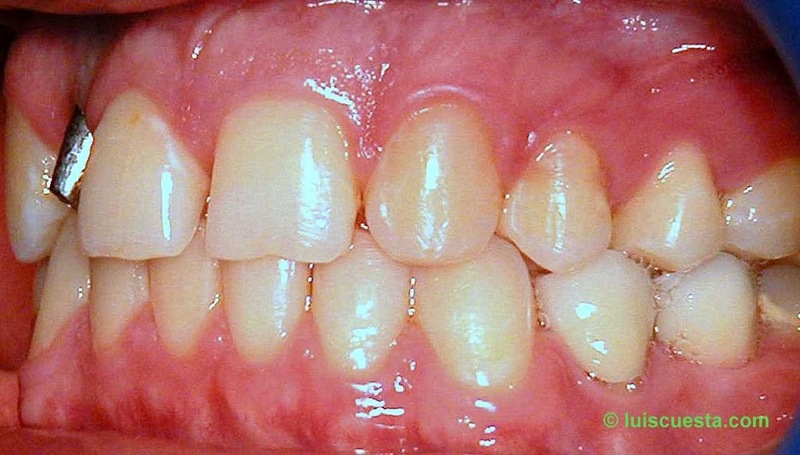 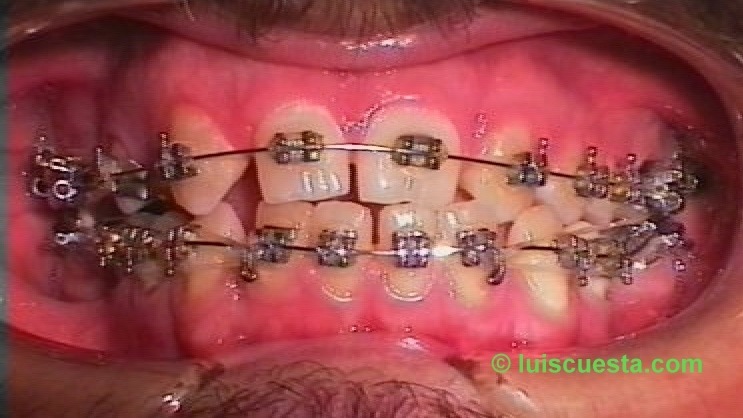 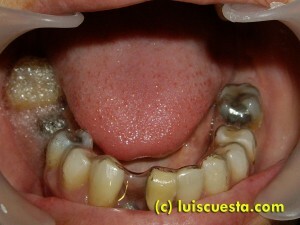 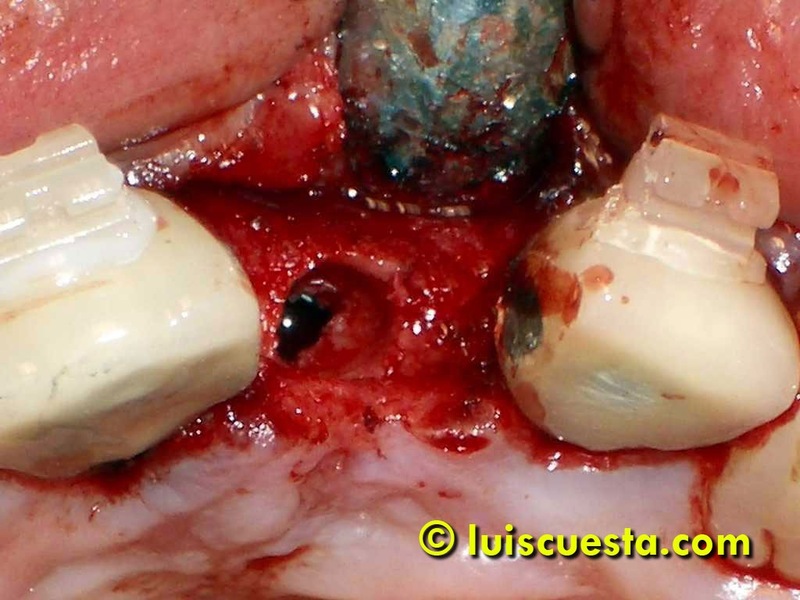 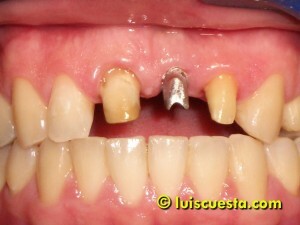 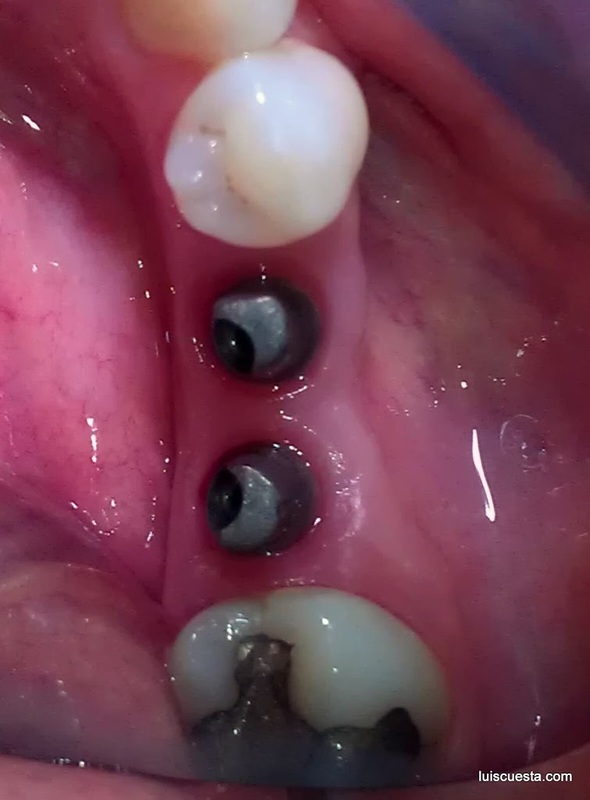 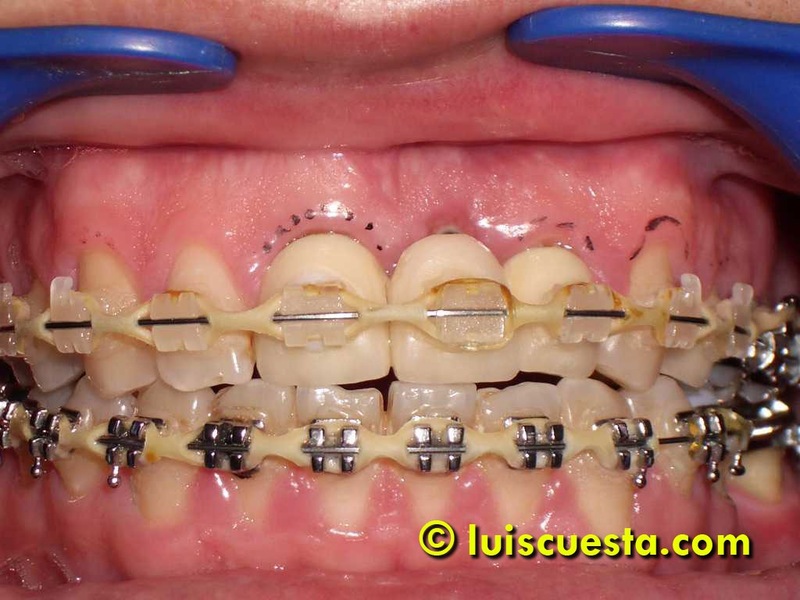 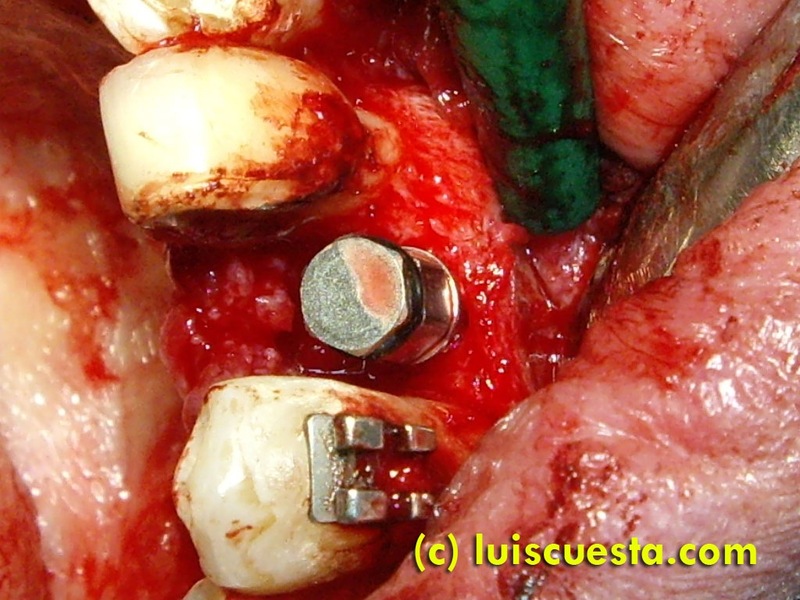 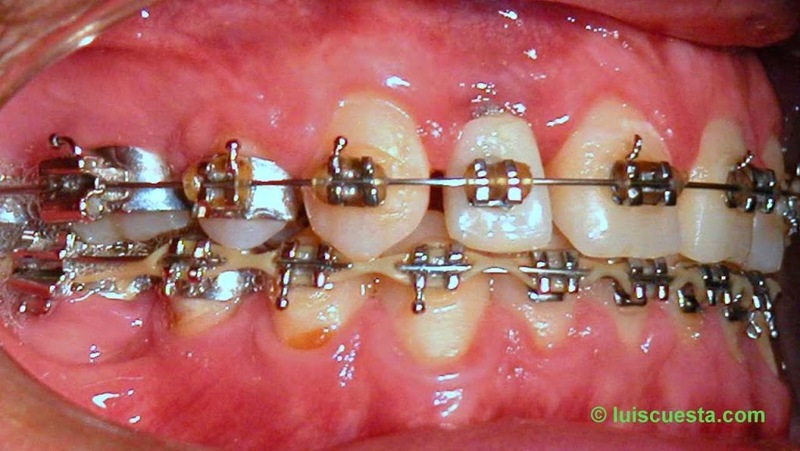 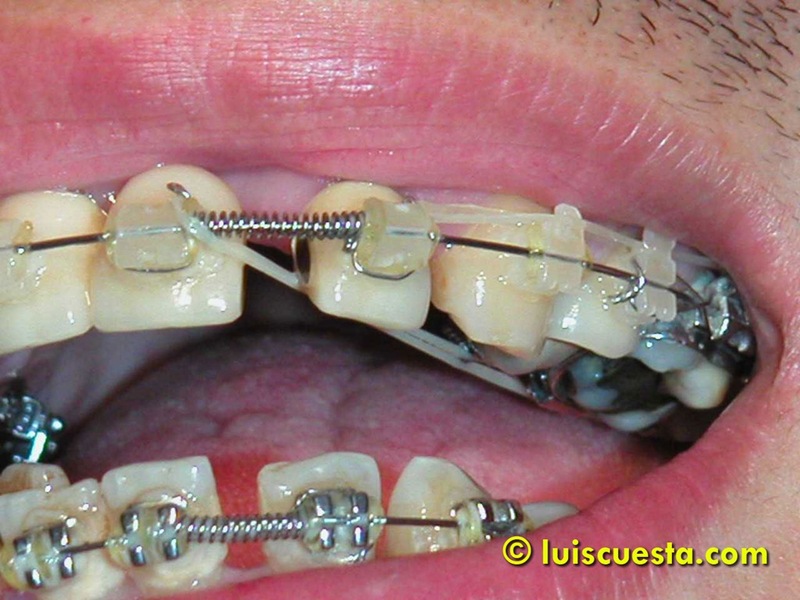 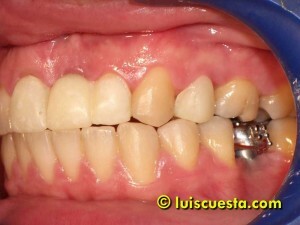 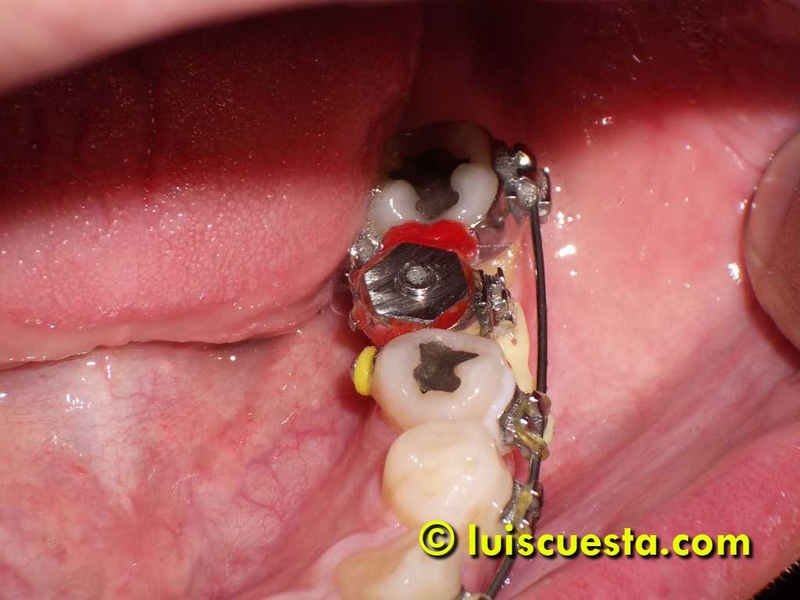 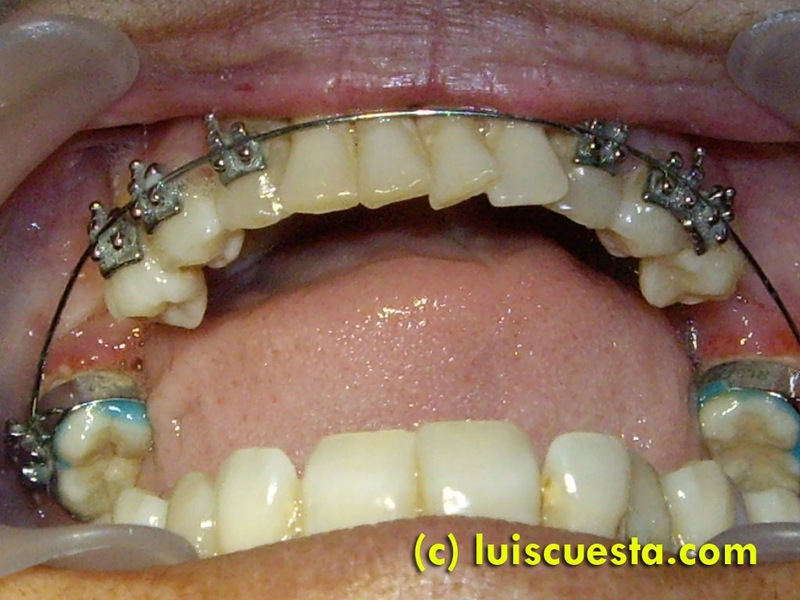 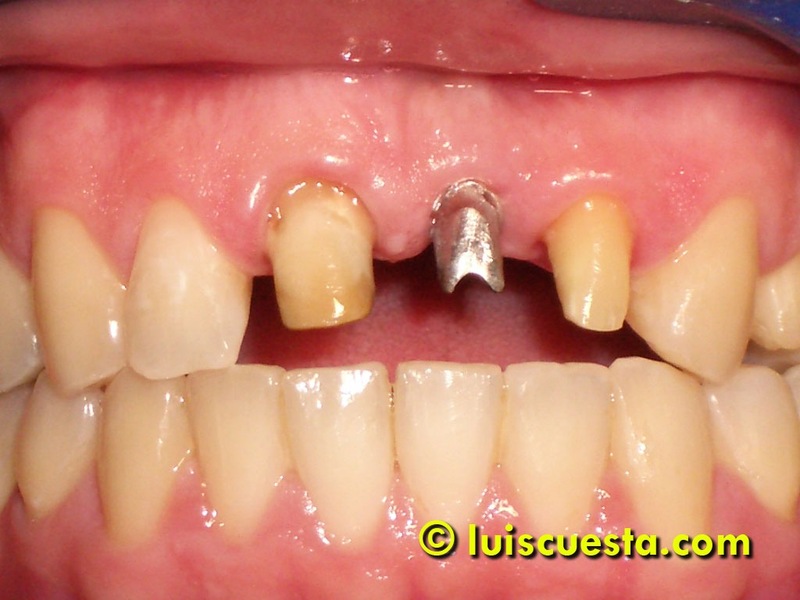 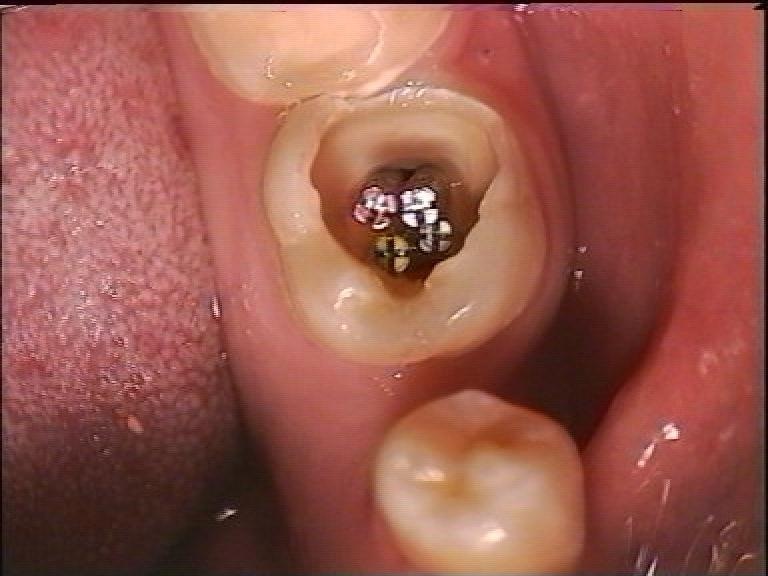 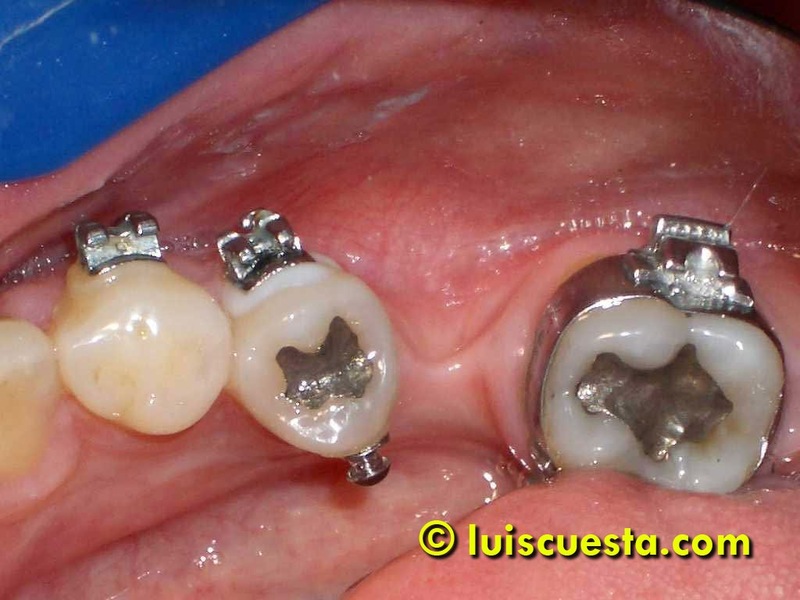 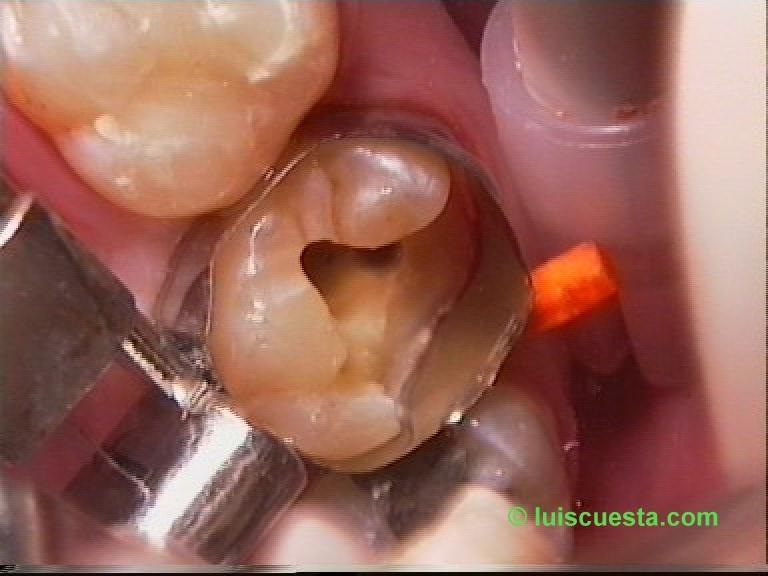 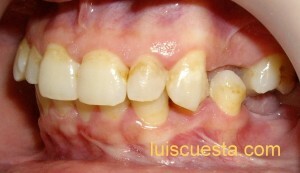 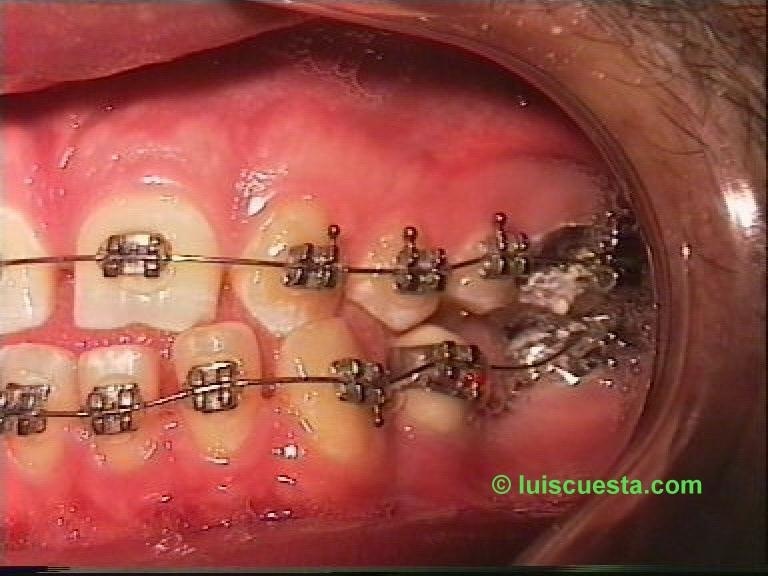 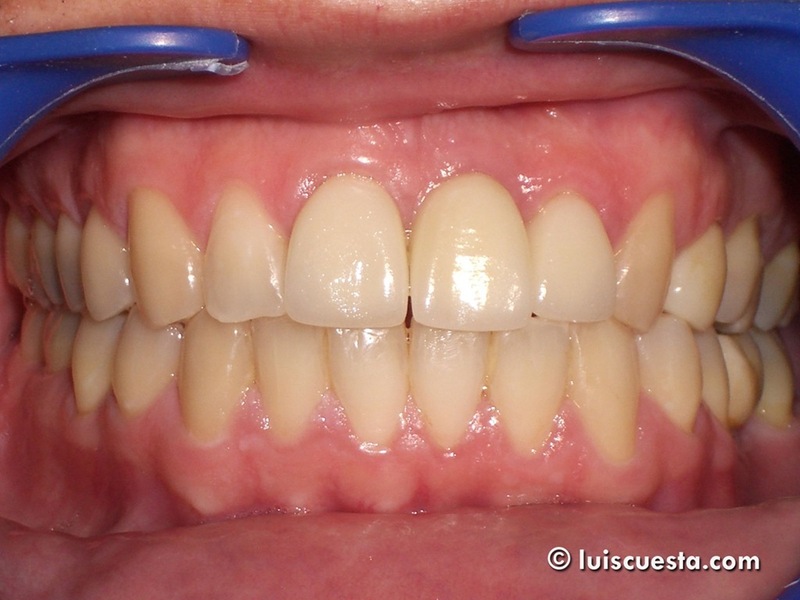 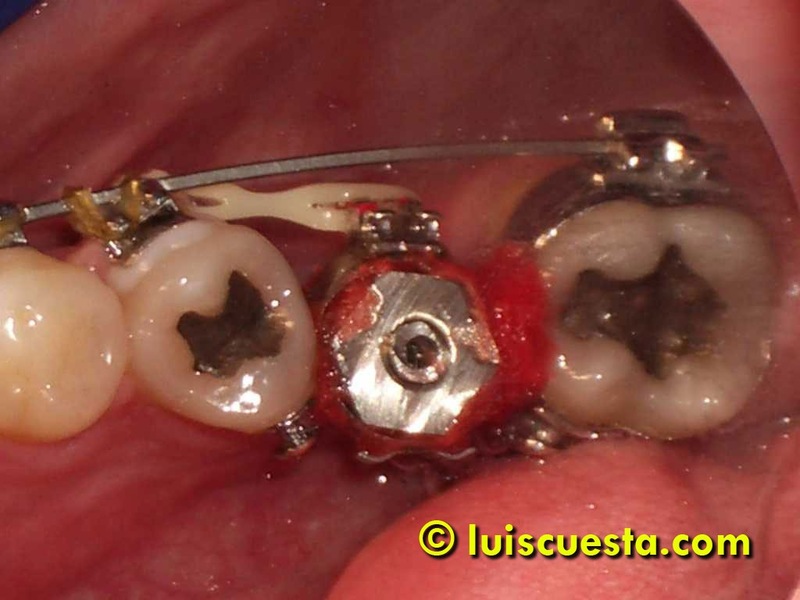 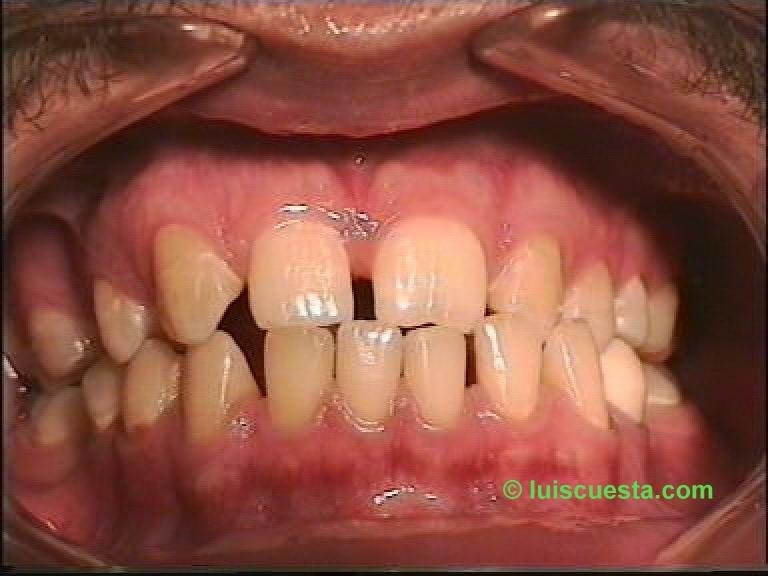 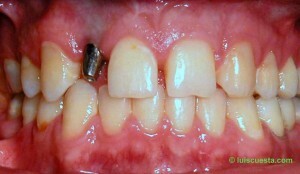 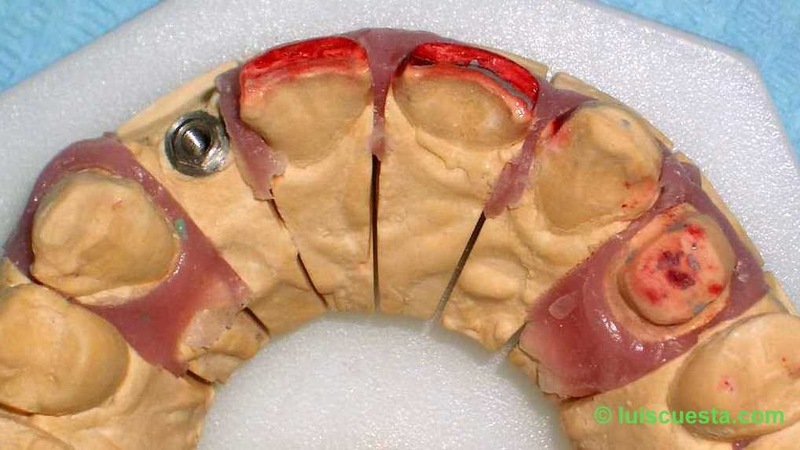 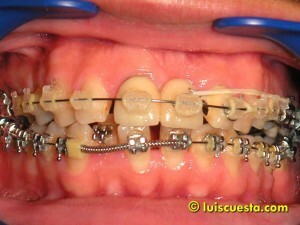 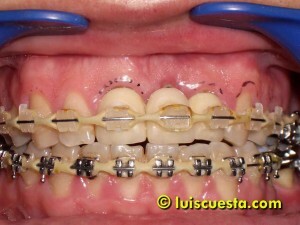 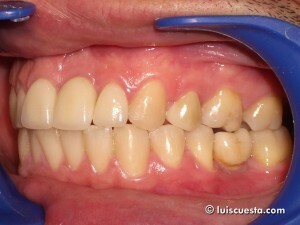 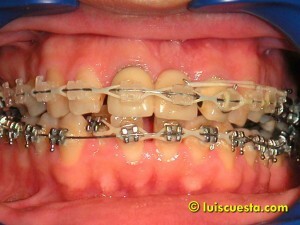 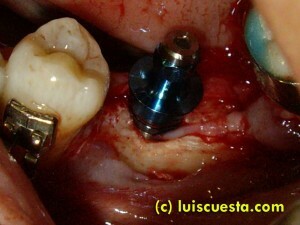 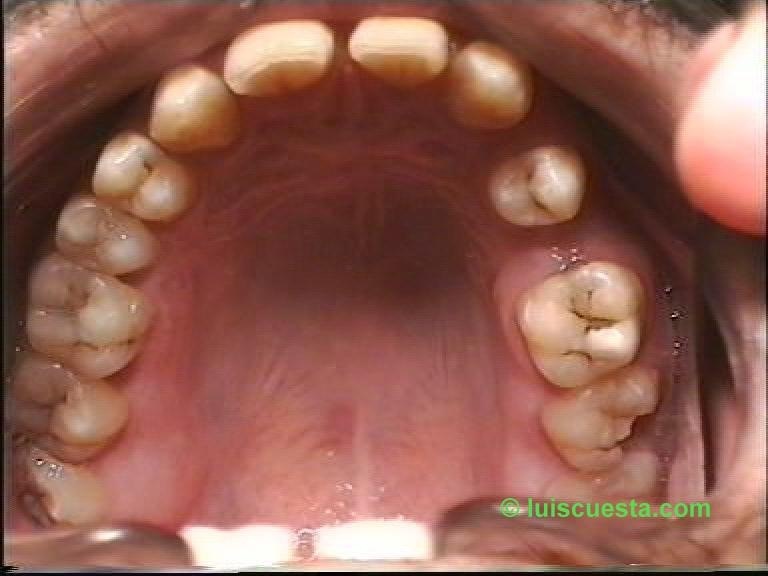 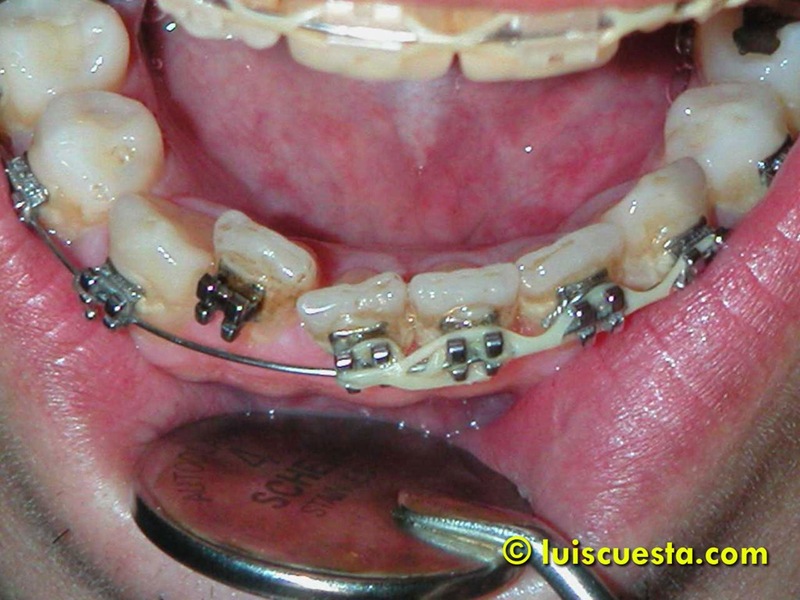 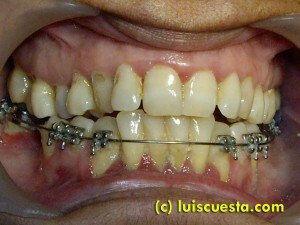 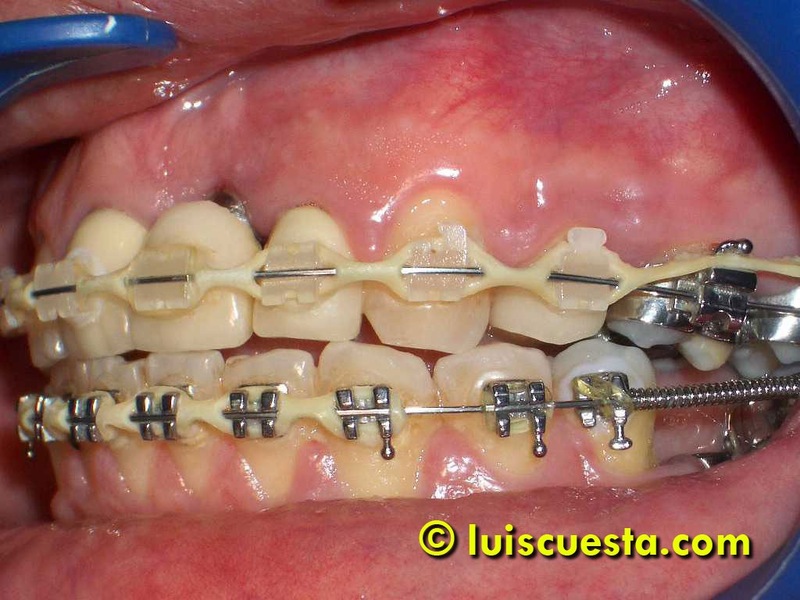 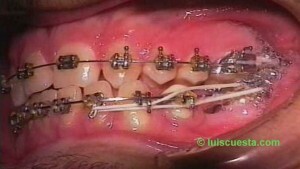 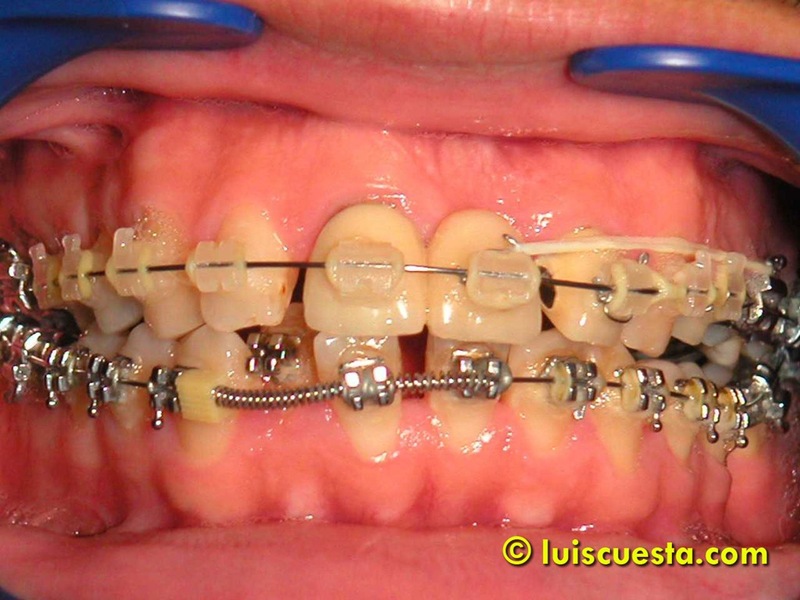 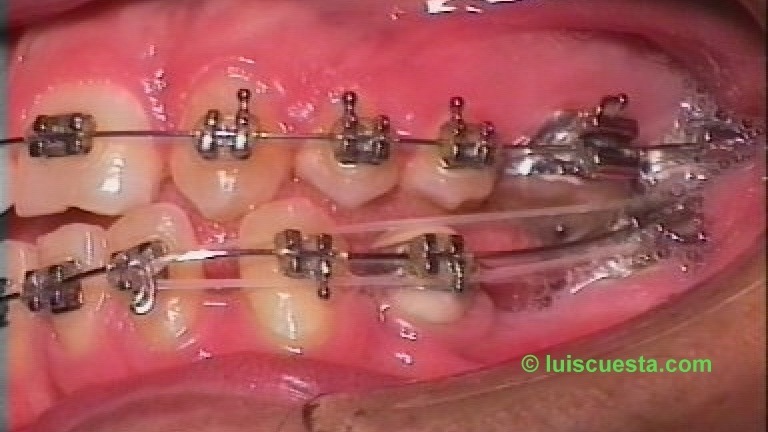 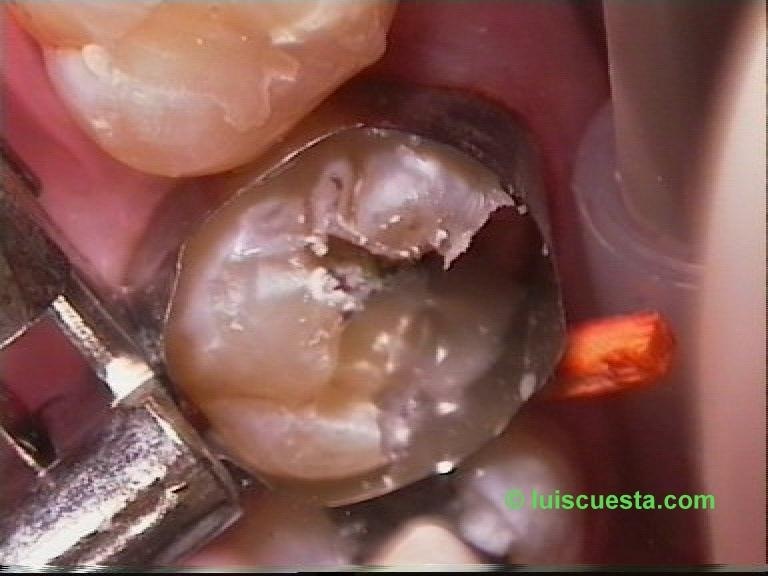 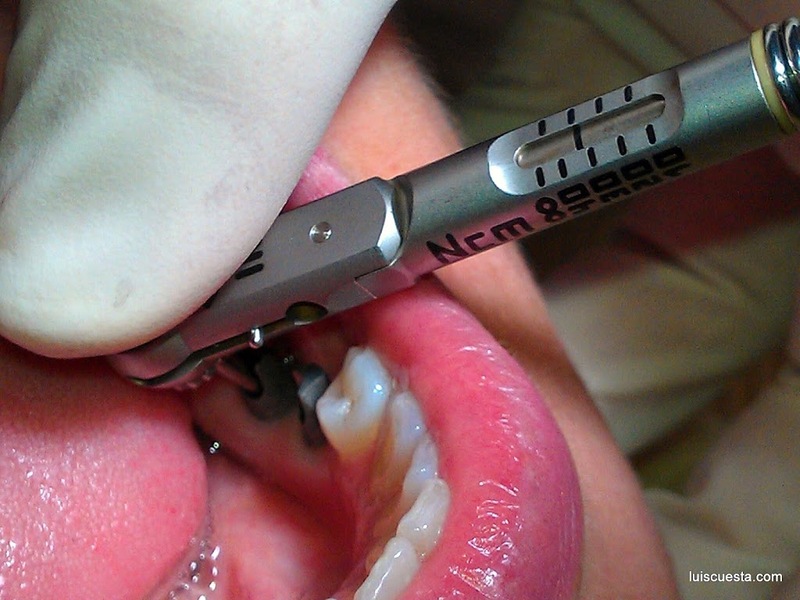 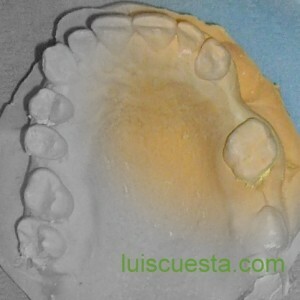 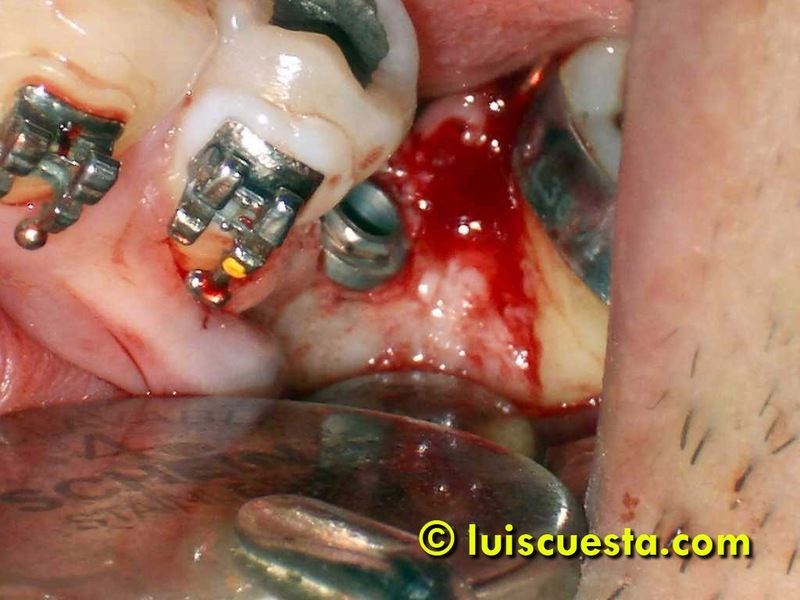 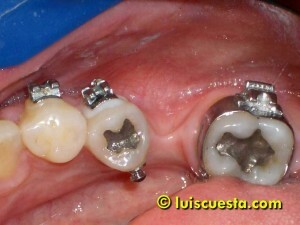 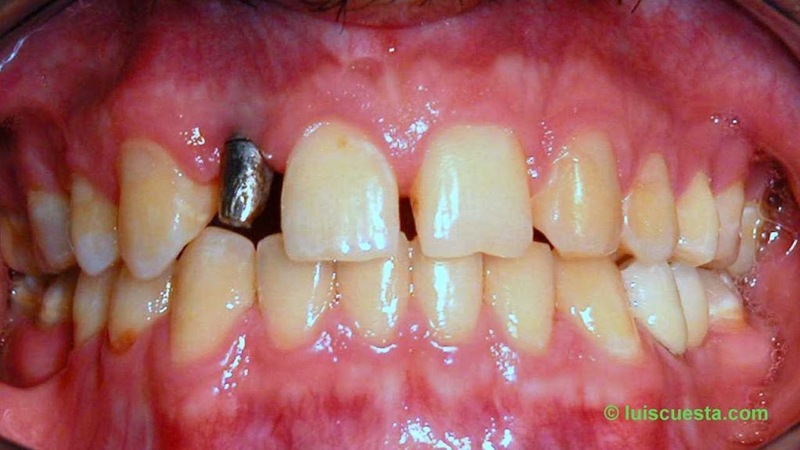 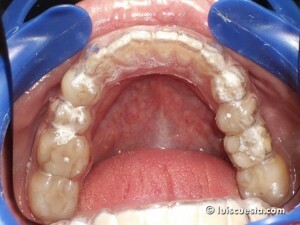 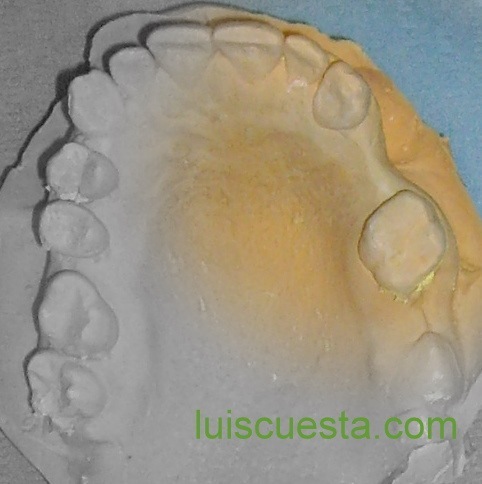 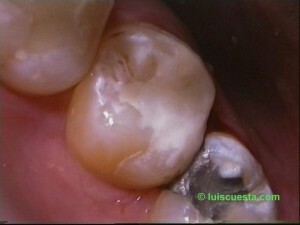 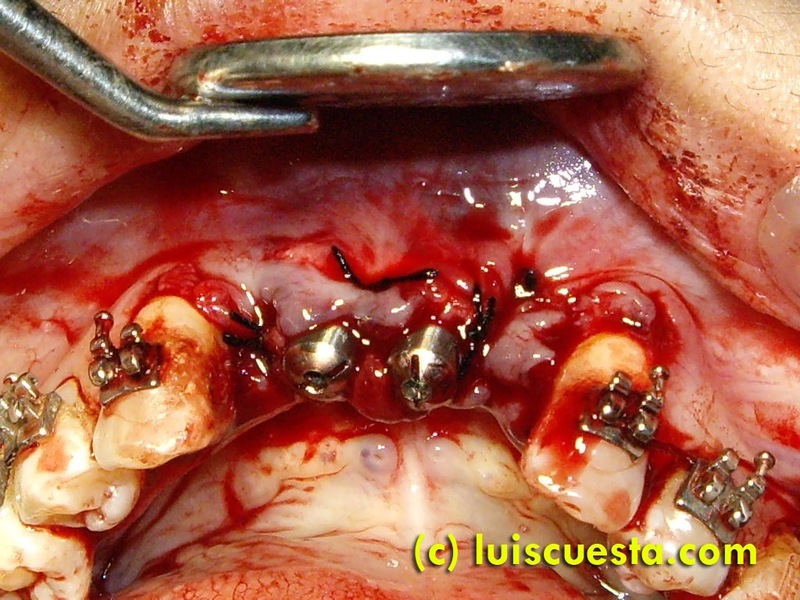 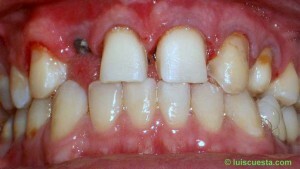 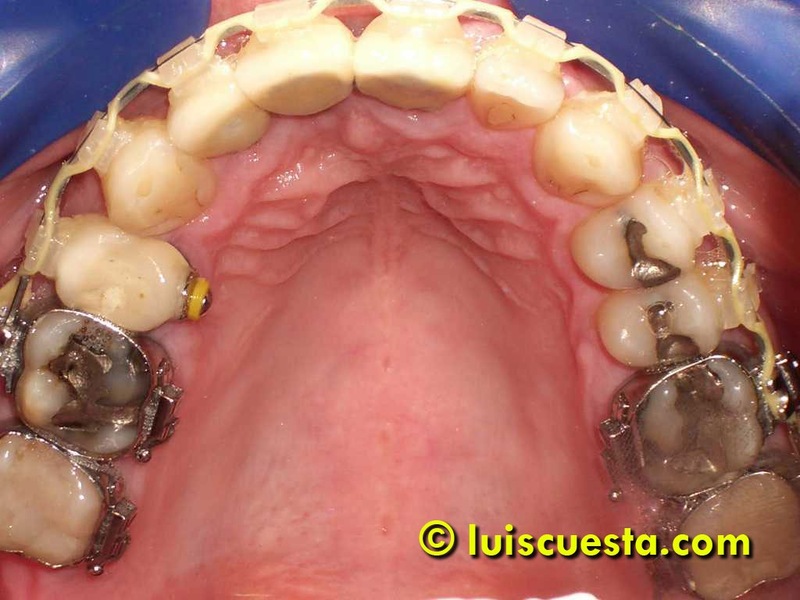 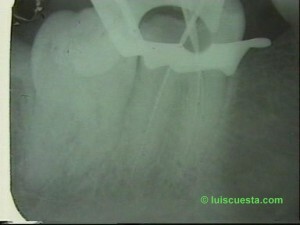 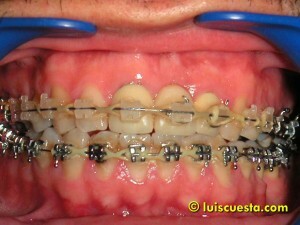 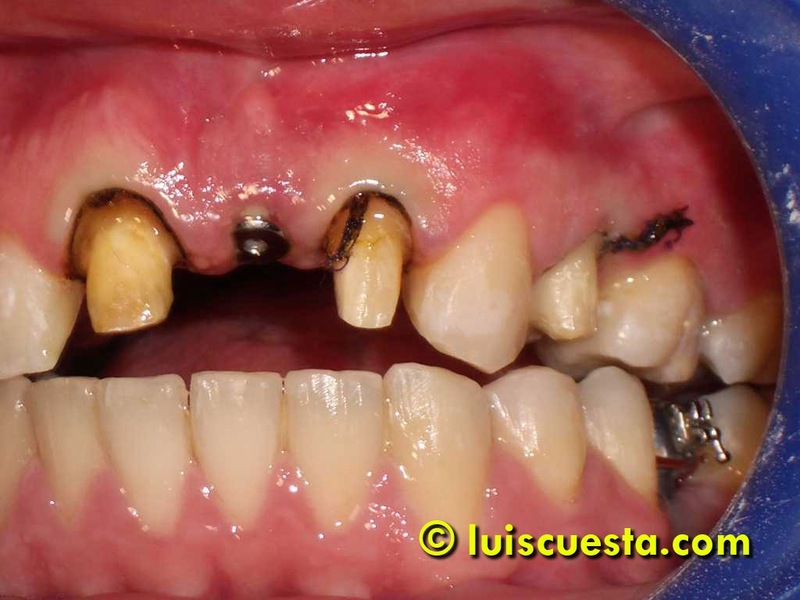 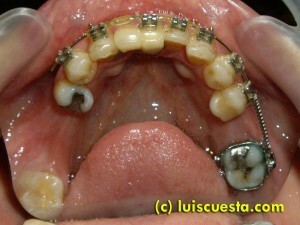 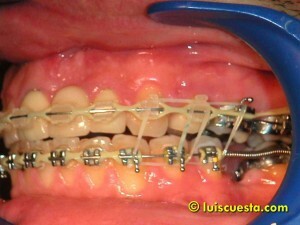 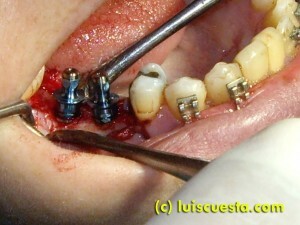 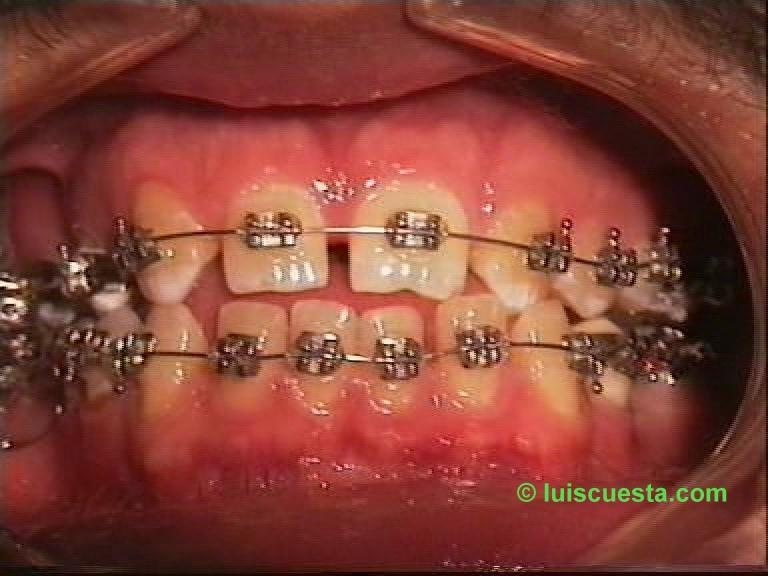 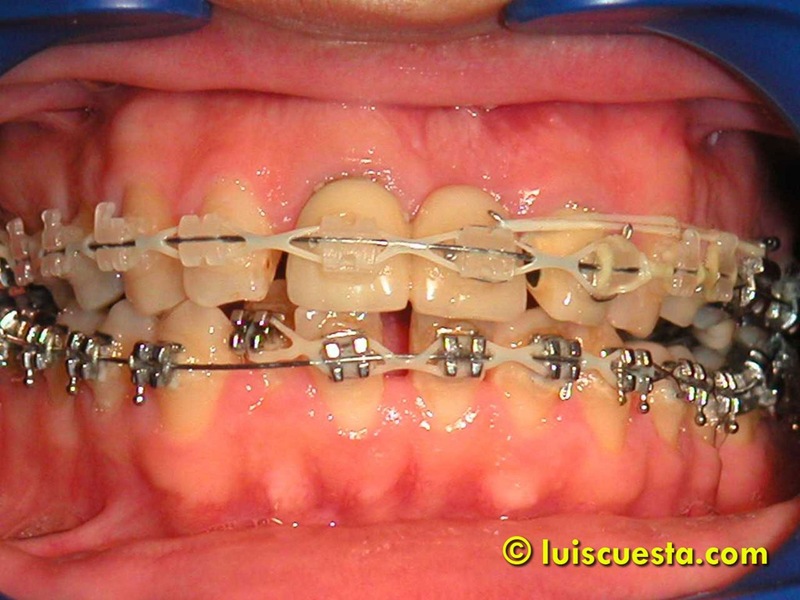 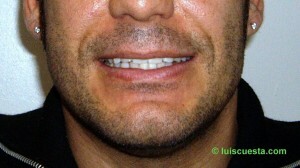 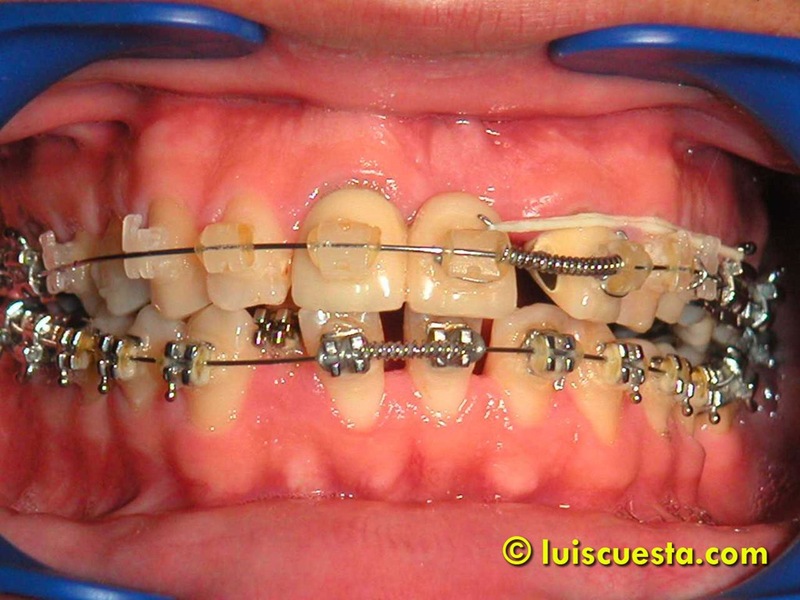 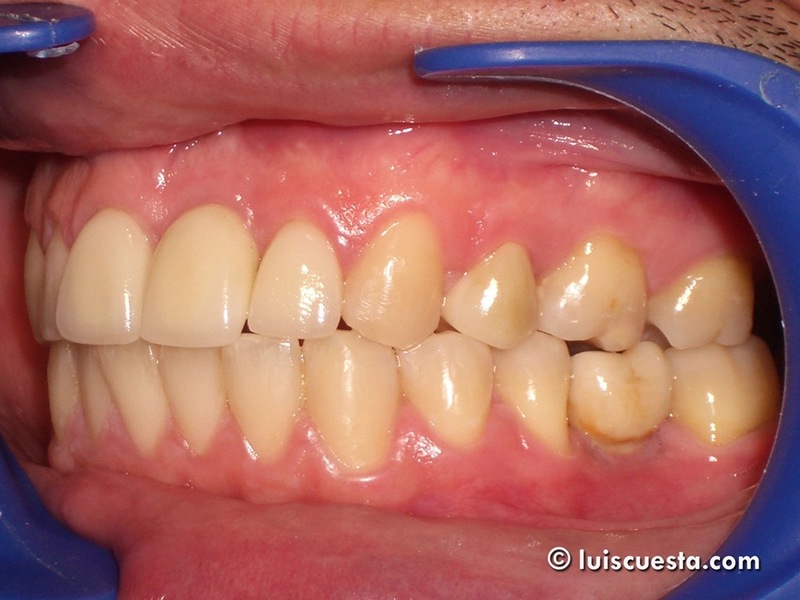 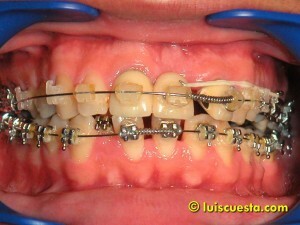 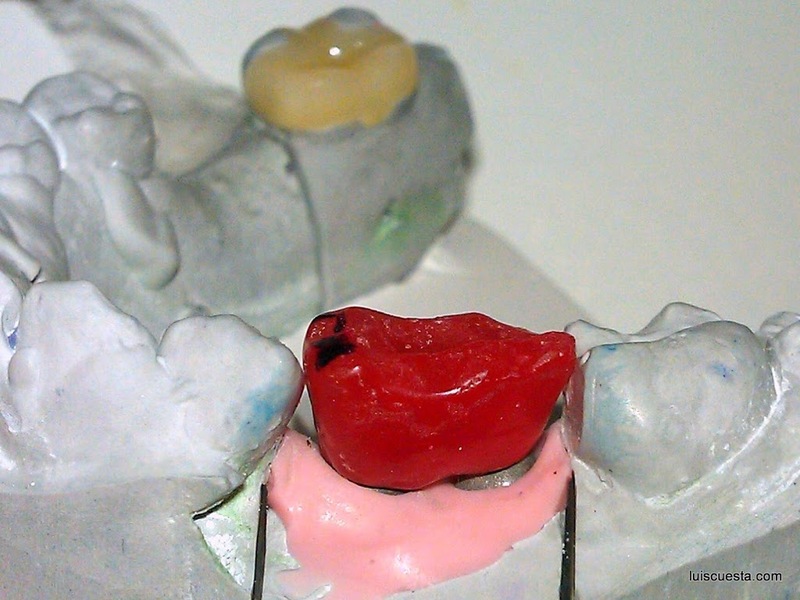 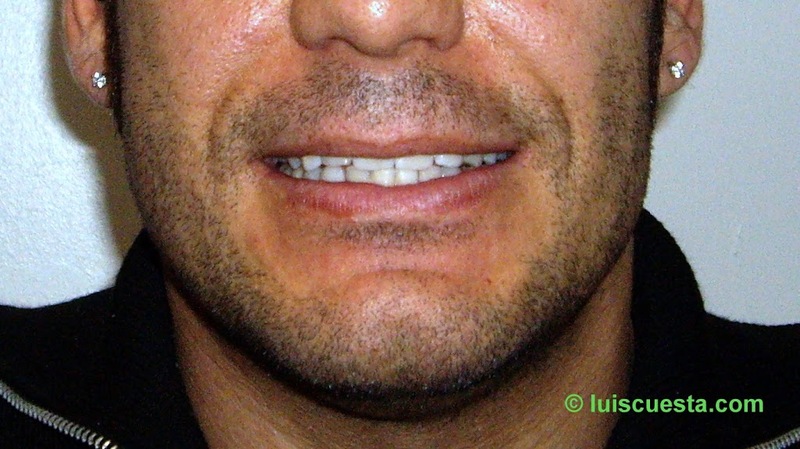 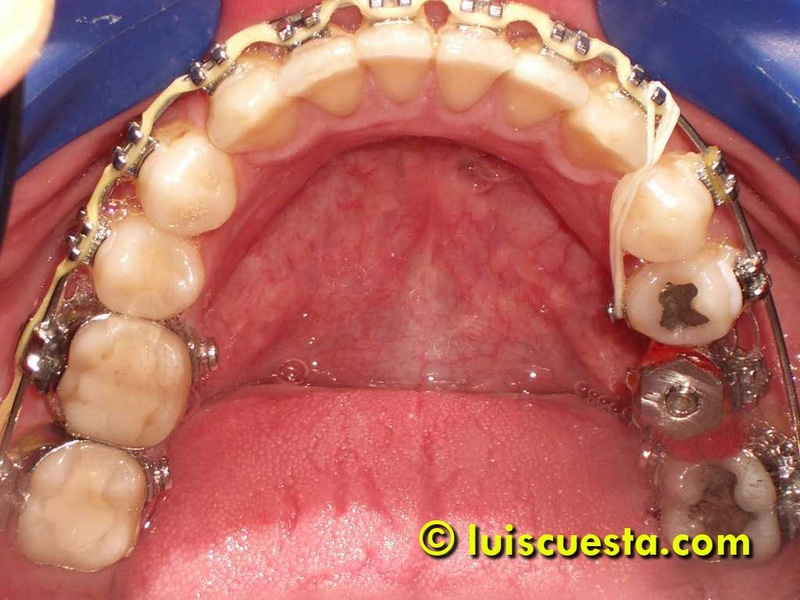 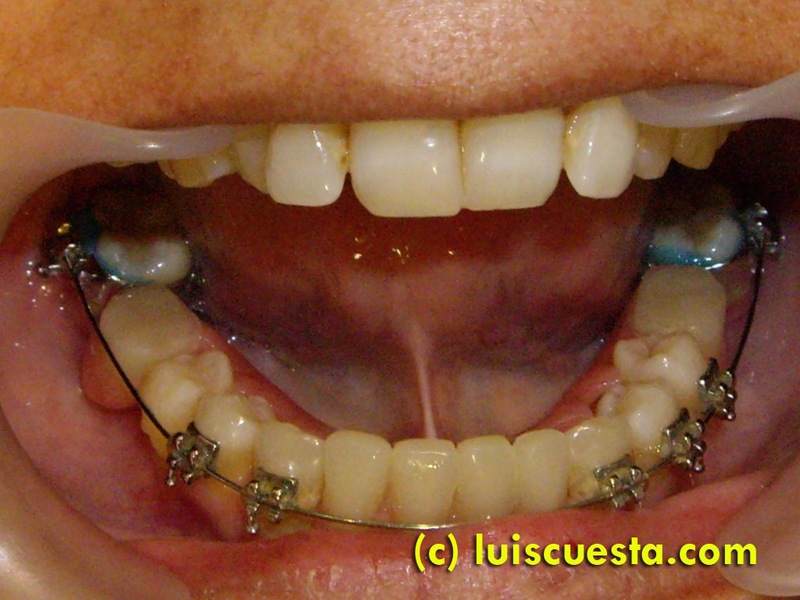 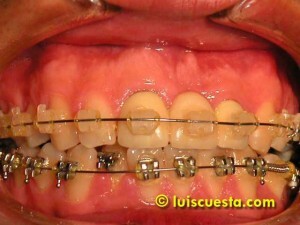 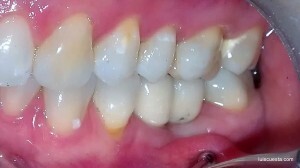 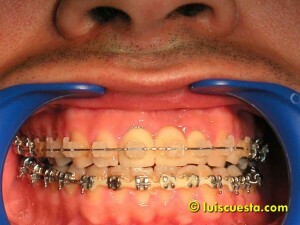 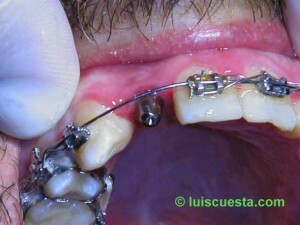 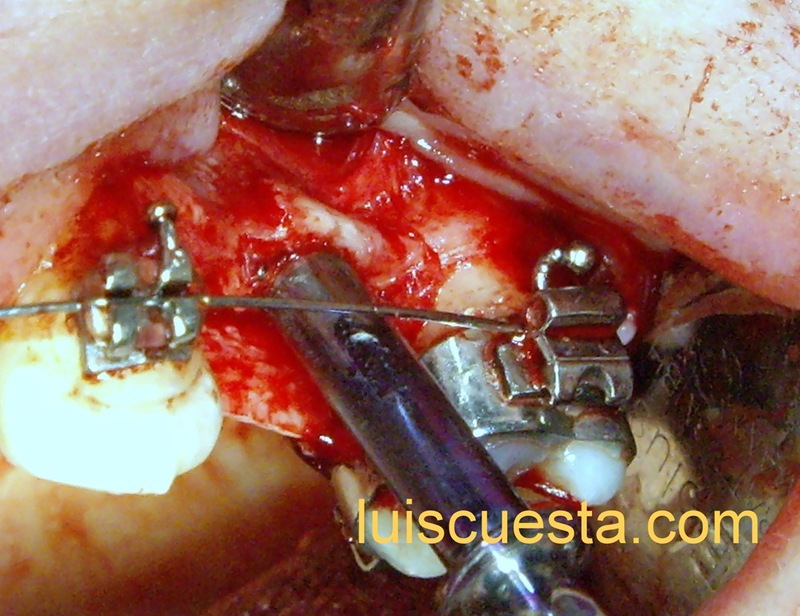 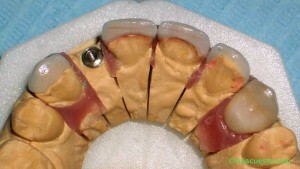 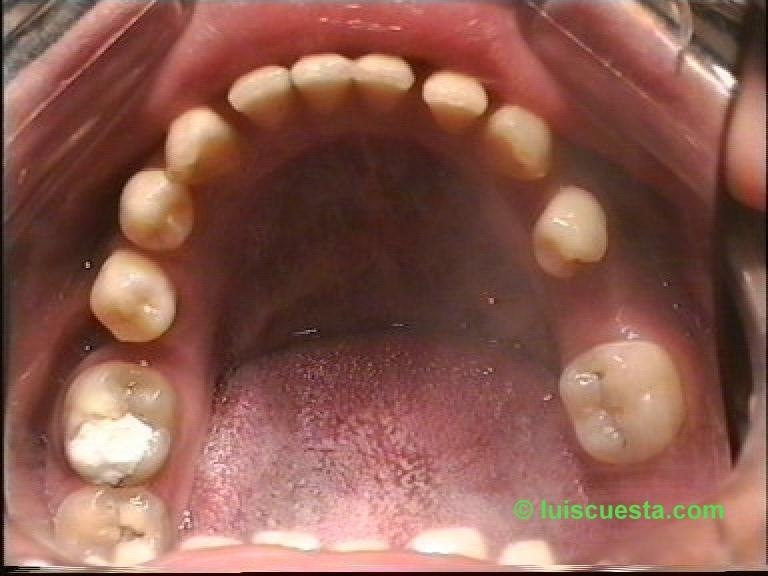 This case shows how to place an implant in a narrow ridge after several years without teeth. 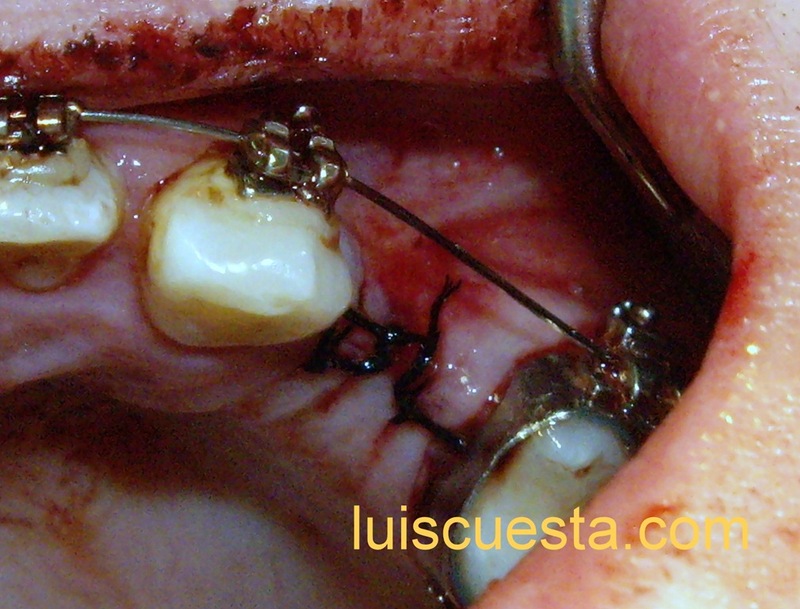 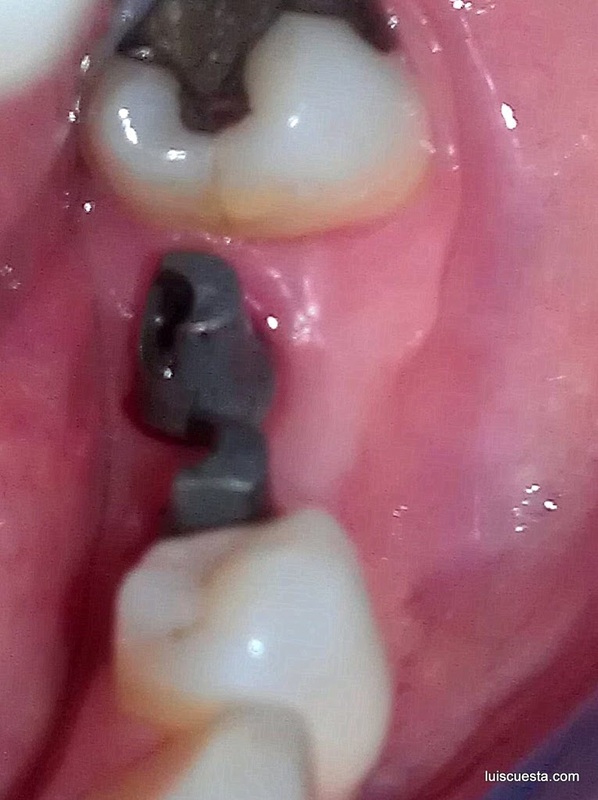 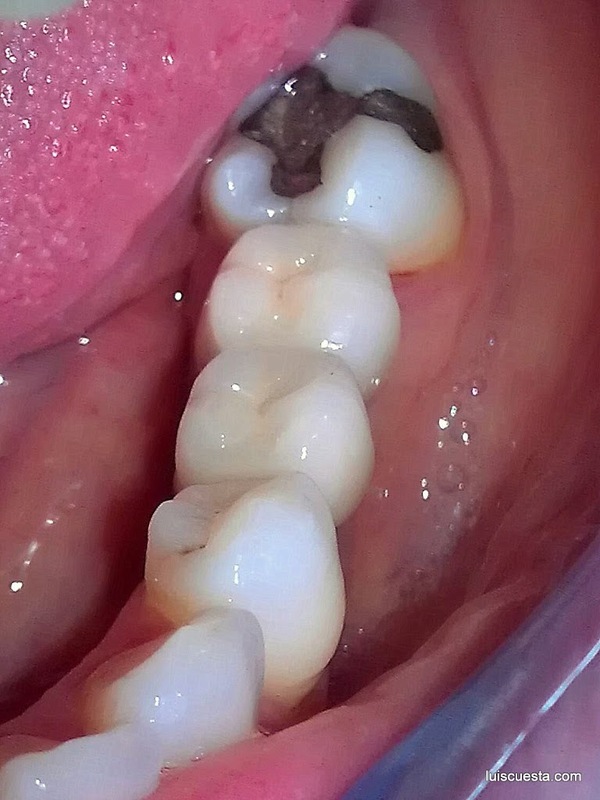 This patient lost the two premolars, but we will only replace one, a little distally, for a fellow doctor to retrude the cusp with orthodontics, anchored on the implant. The two corticals have collapsed transversally, leaving a ridge much narrower than what I need to place a 3.2mm standard (hollow) where to screw abutments for the ortho treatment as a well as the final prosthesis. Once I open the flap I find a ridge even narrower than I expected. This is not unusual. 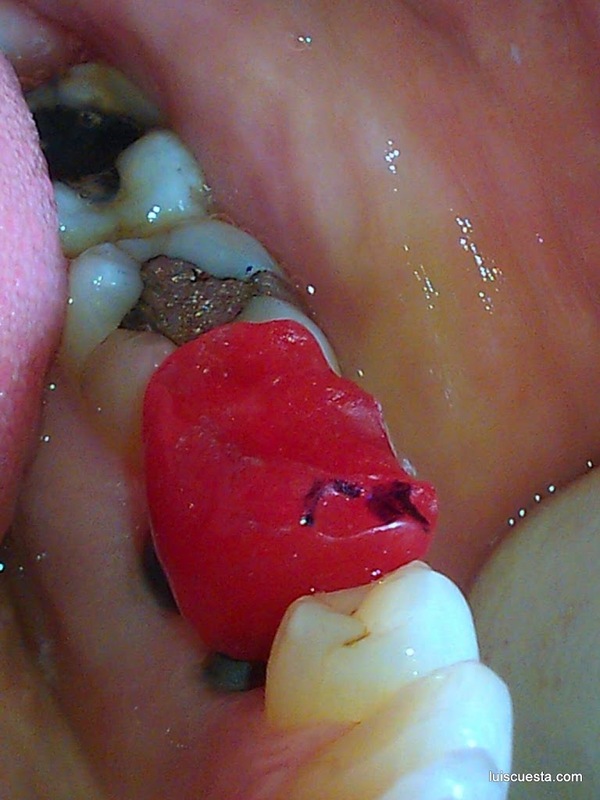 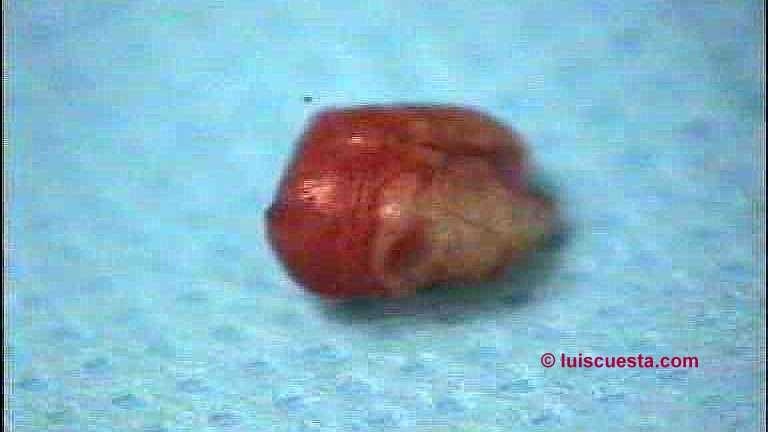 Soft tissue often keeps volume rather normal, while the bone undergoes a grater resorption. We can’t do any drilling here. 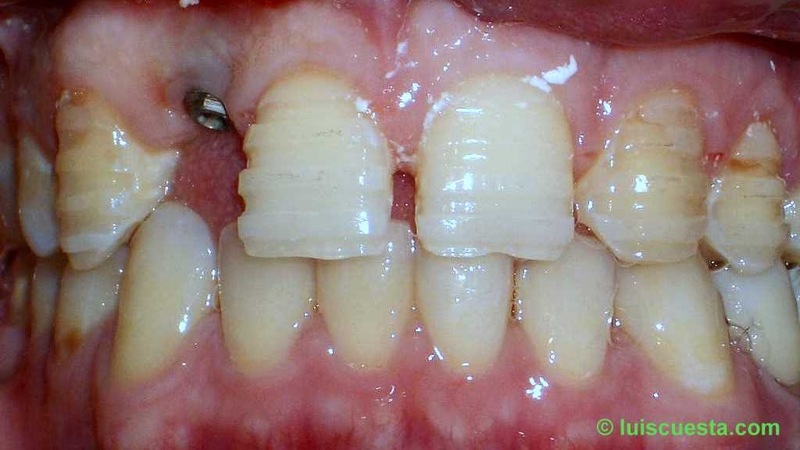 It would remove the little spongeus bone left in between the two inner and outer corticals. 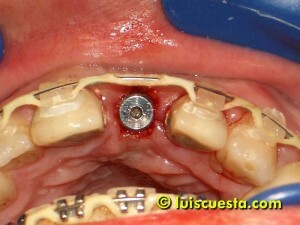 The first approach is to do a puncture and try to expand it. 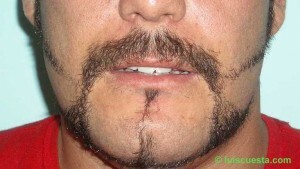 This gives me an idea of the bone density and elasticity. The more spongeus there is, the more malleable the bone is. 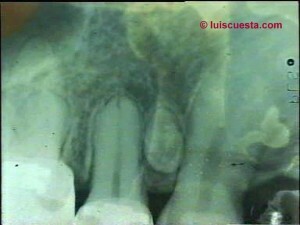 This section of the bone presents both corticals closely collapsed together. The bone doesn’t accept further expansion, it doesn’t flex. 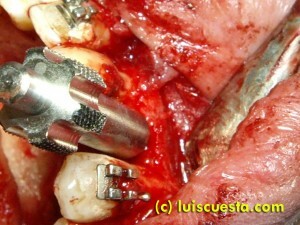 So I need to split the bone. 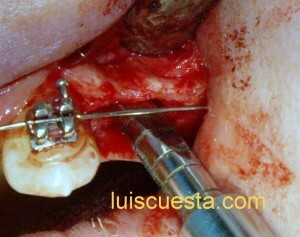 I use a radial mini-saw to open the ridge and a set of chisels to enlarge the opening. 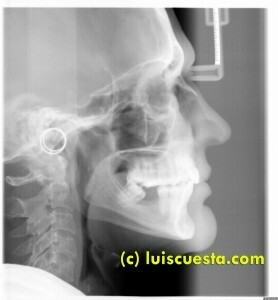 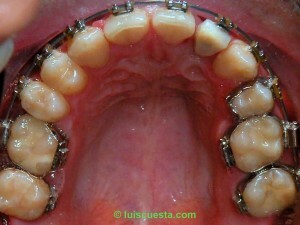 Then, I use more expanders until I reach the necessary width to insert the thinnest implant available. 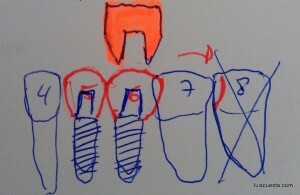 Note that the direction may not always be the best. 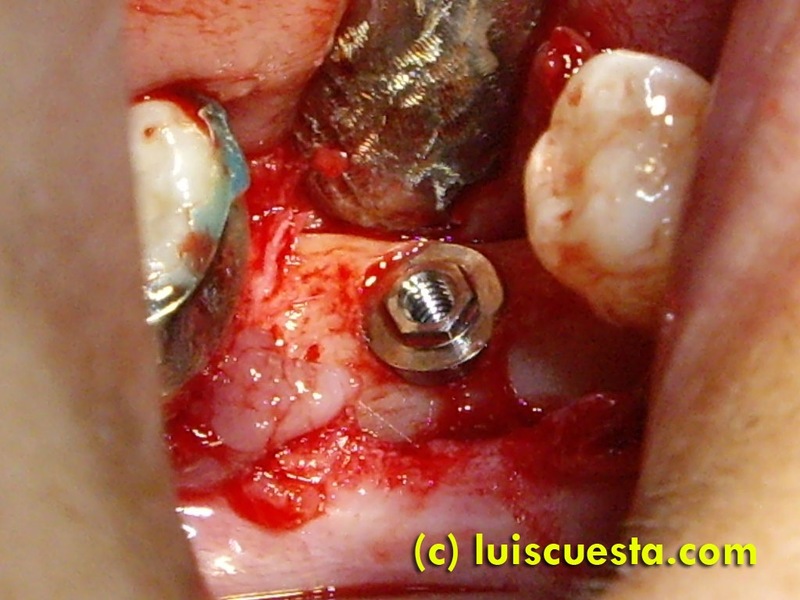 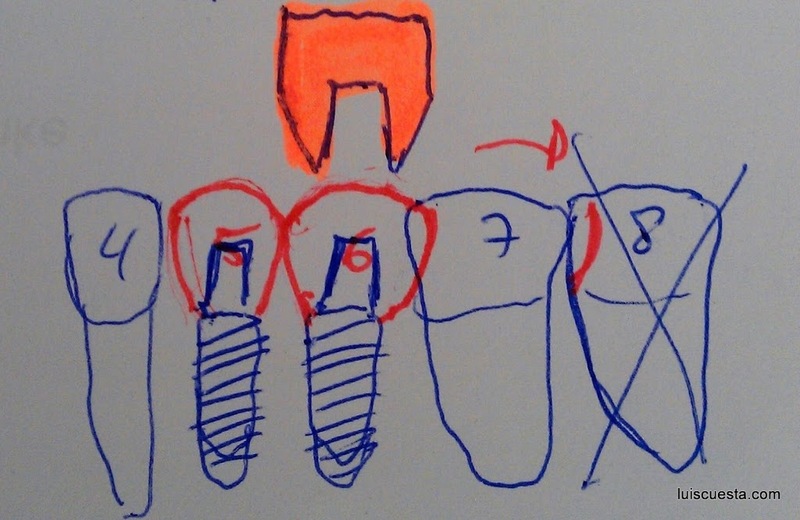 The concavity of the external bone forces the direction of the implant to be not straightly vertical, as it would provoke exposition of the end part of the implant threads. This is the final position. 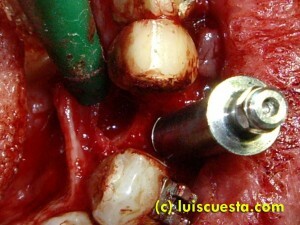 The bone expansion can be appreciated. 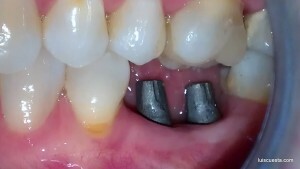 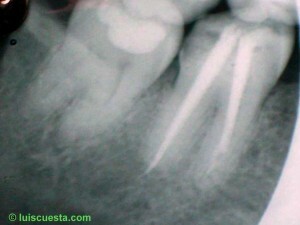 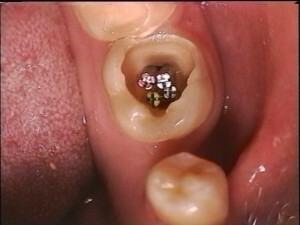 Sometimes there is a remaining gap along the ridge, both in front and behind the implant. In those cases we need a membrane to cover it, but this is not that case.